And we have a winner of this year's The Band Christmas Quiz! Congrats to Susan Slinger from Canada, and thanks to Jonathan Katz for providing the sound samples for the quiz. Added the album To Heaven U Ride (Michelle Shocked, 2007) to the list of covers of Band songs. Contributed by Peter Viney. New "BandBite" from Carol Caffin: "An Interview with Colin Linden". "For Rick on His Birthday", by Carol Caffin. 65 years ago, on December 29, 1942, Rick Danko was born. He is deeply missed. The music will live forever. Jim just finished producing and playing guitar on Lucy Bo's new CD, also Dean Batstone's CD just came out that Jim recorded all the guitars on. Jim is currently producing and playing guitar on a new CD for Scott Paul. Jim and Analog Mike are featured in the new video Fuzz (about vintage fuzz pedals). Jim filmed a video demo of his new signature amp JW40 which Ben Fargen is putting up on the web in January. Jim is a featured Celestion speaker endorser at Partners in Tone on www.celestion.com. ProJECT PERCoLAToR is going to Tour Italy and Switzerland plus, starting last week of March 2008, the dates will be posted up in the next couple of weeks! More new 2008 Jim Weider concert dates available from jimweider.com. Added a page for the album Tribute to Haruomi Hosono (Various Artists, 2007), featuring Garth Hudson. Thanks to Maud Hudson and Dave Zuck for the information. A reissue of the 1970 album Buck Owens "Live" in Scandinavia, with covers of "Cripple Creek" and "Dixie". The new Sneaky Pete Kleinow compilation The Shiloh Records Anthology, featuring an instrumental version of "It Makes No Difference" first released in 2001 on Meet Sneaky Pete. Thanks to David Powell for the info. The Band's official photographer, Elliott Landy, will be at the Lab Gallery in the Roger Smith Hotel, New York City, this Saturday, Dec. 22, to sign books and prints. Read more about the event and Elliott's Christmas exhibition in NYC here. "Woncha stay an' keep Anna Lee company? ", at her new web site Anna Lee's Favorite Recipes. Anna Lee's home cooked meals are absolutely wonderful. Also, make sure to read her bio. And, finally, there's an official announcement from the Grammy web site: "Special Merit GRAMMY Honorees Named". Quote: "Recipients of the 2008 Lifetime Achievement Award, Trustees Award and Technical GRAMMY Award were announced today by The Recording Academy. Burt Bacharach, The Band, Cab Calloway, Doris Day, Itzhak Perlman, Max Roach and Earl Scruggs will receive The Recording Academy Lifetime Achievement Award." "Take a load off: The Band finally get their Grammy" -- from the National Post yesterday. Link provided by Paul Schoninger. "Toronto's The Band to get lifetime Grammy" -- article posted at cbc.ca today. Thanks to Terry Brown for the link. Added the 1986 article "A Haunting Suicide Silences the Sweet Soulful Voice of The Band's Richard Manuel" and scans of the program for Richard's funeral services. Both contributed (a long time ago) by Serge Daniloff. Added lyrics and chords for the song "Got Me a Woman" from Levon Helm's Dirt Farmer. Transcription by Peter Stekel. You MUST check out the new home page of garthhudson.com! Brilliant!! Big news, announced today: The Band have been honoured with The Recording Academy's 2008 Lifetime Achievement Award! Other recipients of the award this year are Burt Bacharach, Cab Calloway, Doris Day, Itzhak Perlman, Max Roach and Earl Scruggs. Some company to be in! Congrats to Garth, Levon and Robbie for this outstanding acknowledgement of the quality of their work and their huge influence on popular music. Also, thanks to the Academy for honoring the memories of the late, great Rick Danko and Richard Manuel, by giving the award to the whole group. Read more about the 2008 Lifetime Achievement Award at businesswire.com. This calls for celebration -- rakfisk and aquavit is on the menu tonight! "Choosing the best music of Canada: The sound of a nation" -- article from The Buffalo News about Bob Mersereau and his new book The Top 100 Canadian Albums, with a nice section of The Band, who are represented with 3 albums in the top 100. Thanks to Paul Schoninger for the link. The "Poor Old Dirt Farmer" video with Levon Helm and Little Sammy Davis is now available from levonhelm.com. Vanguard Records has created an artist page for Levon Helm, with bio, sound clips and more. New 2008 Midnight Ramble Dates with the Levon Helm Band! "Back at the Helm" -- very good article on Levon Helm and Dirt Farmer by Jeff Schwachter, from the Atlantic City Weekly, 11.22.2007. Added Kay Cordtz' review of Dirt Farmer from the latest issue of Elmore Magazine. Tuesday's Levon Helm program on National Public radio is available for listening on the web. Very nice program, including an interview and several tracks from Dirt Farmer. An interview with Levon Helm will be broadcast today (December 11) on the in-depth interview program, Fresh Air, on National Public Radio in the U.S. See the NPR web site for a list of stations and broadcast schedule for Fresh Air. Thanks to Sue Frank for the info. Today, it is eight years since we received the sad news that Rick Danko had left us. You may want to revisit the old guestbook from that day and the days that followed -- the response from Band fans on the net was overwhelming. Added the album The Lilac Years (Blond, 1969) to the list of covers of Band songs. Thanks to Olof Siverbo for the information. New photos from the 11.24.2007 Midnight Ramble are now available from levonhelm.com. "CONGRATULATIONS to LEVON HELM whose latest release Dirt Farmer has been nominated for a Grammy in the category of Best Traditional Folk Album (Vocal or Instrumental.)! You've earned it! ... Garth and Maud"
And here's another great review of Dirt Farmer. Thanks, Kay. "I Got Me A Woman"
Thanks to Rudy Veirman for the links. "Helm, now 67, was so buoyed by making new music that he's already looking forward to a follow-up album. 'We've got another 12 or 15 songs, most of 'em are pretty good,' Helm said. 'It is a wonderful thing that's happened to us.'" Thanks to Philip D'Amour for the link. Dirt Farmer is currently #3 on the Americana Music Association's Airplay chart! Thanks to Joe McSpadden for the info. Here's a version of "The Weight" with Robertson and friends, from Saturday Night Live, 1992. Just announced: Levon Helm's Dirt Farmer has been nominated for a Grammy in the Best Traditional Folk Album category! The Horseshoe Tavern on Queen Street West. Is celebrating it's 50th Aniversary in 1998. For those of you that don't know, The Horseshoe Tavern in Toronto, Is one of the pillars of live music... the best night was in 1989. When The Band got their Lifetime Juno Award, The Band was playing at the Horseshoe, and Robbie Robertson showed up at the back door, with his guitar. He apparently joined The Band on stage. And the owner apparently bought drinks For the entire bar for the next two hours. I remember the CBC broadcast of The Band playing with Blue Rodeo behind them. The Band being Robbie, Rick and Garth. Sans Levon. Was anyone there? If you were, let's hear about it. "Several years ago, The Band was in town to receive a special Juno Award. The `Shoe had The Band onstage that Saturday, of course less Robbie Robertson. They had not performed together for many years. About 12:30, the back door opened and in walked Robbie with his friend Reg Bouvier. I also noticed he had a guitar with him! My blood pressure went through the roof with excitement. Was I going to see a Band reunion in my club? Robbie opened up the guitar, put it on and entered side stage. The look of surprise on every one of the members on stage brought tears to my eyes and a roar from the crowd only equal to the night the Stones hit our stage. " So, can anyone confirm that Robertson actually joined The Band (including Danko, Helm and Hudson) again on stage in '89? There will be three(!) New Years Midnight Rambles at Levon Helm Studios this month! OK, we've added a few hints that should help you solve the Christmas Quiz. Rolling Stone online lists The Last Waltz (1978) as one of "The Twenty-Five Best Live Albums". Thanks to Rick S. for the link. Looks like this year's The Band Christmas Quiz is a bit too difficult? No correct answers received so far... do we need to post a hint or two? Daniel Lanois' new soundtrack album Here Is What Is, featuring Garth Hudson, will be digitally released on December 15 via redfloorrecords.com. On March 18 next year, Red Floor will release the new album on CD as well as the Lanois documentary of the same name. The film premiered this fall at the Toronto International Film Festival. Thanks to Daan Arts for informing us. "The Band's venerable pulse airs songs he grew up with in rural Arkansas." "Earthy, reassuringly calloused country and bluegrass is its currency..."
"...drip old-school dignity an a keen awareness of lineage." Thanks to Rudy Veirman for the update. A video has been produced for the track "Poor Old Dirt Farmer" from Levon Helm's new solo album. A low-resolution version is currently available from amazon.com (version 8 or higher of the Flash Player required for viewing). "On film, this band plays on" -- interesting article from the Montreal Gazette about the band that plays The Band/Hawks in the new Dylan biopic I'm Not There. Thanks to "boar" for the link. "We're busy shooting a sequel to Shakin' All Over, this time covering Canadian artists in the 1970s. Do you know of any TV performances that The Band gave in England or Europe during that period, leading up to The Last Waltz? In particular, we're looking for performances of songs like 'Ophelia' or 'Acadian Driftwood.' Any help you or your website readers can provide would be greatly appreciated." Shakin' All Over: Canadian Pop Music in the 1960s, the documentary that aired last year on CBC featuring Robbie Robertson, Garth Hudson and countless other Canadian stars, comes out on DVD Dec. 11, with plenty of bonus interviews and a portion of sales going to MusiCan, the music education charity of the Canadian Academy of Recording Arts and Sciences. The DVD is available from capitolmusic.ca. The Levon Helm web site has been redesigned. Nice job, Tony! In a recent Movies Rock magazine (supplement to Self magazine) documentary ranking, Eat the Doc ranked #1. Easy Rider, which features The Weight by The Band, ranked 14th in the best soundtracks ranking w/in the same mag. Martin Scorse's Mean Streets (featuring Robbie Robertson musically) was ranked 3rd in the Unreleased Soundtracks ranking. We can't say that we completely agree w/ the rankings as Prince's Purple Rain soundtrack is ranked #1. There is also an article about Scorses's new Rolling Stones concert film Shine the Light. Thanks for everything you & your crew do in providing us w/an amazing website on arguable the best band to ever exist. Your site is by far the best website about any band. "He Shall Be Levon" -- Jack Mctamney's wonderful review of Dirt Farmer. "The Levon Helm Band will be on The Imus In The Morning Show, Monday, Dec. 3rd from 6-10am. This show will be on WABC Radio and a live stream at wabcradio.com, also on RFD TV. Saturday, Dec. 8th it's back to The Barn for a Ramble with Ollabelle. Then the following week, Dec 15th will be The Alexis P. Suter Band. No Ramble on Christmas weekend. Then it's The New Year's Shows!! Saturday, Dec 29th AND Monday, Dec 31st (New Year's Eve Show). There will also be an early show Sunday, Dec 30th at 6pm with Mike & Mharlyn Merritt. We will be announcing guests for all the shows within the next week or so... The New Year's Eve tickets are going fast, so get them while you can! We hope to see you guys there. " Just wanted to add my voice to what must be many... You have created a FanTastic site! Thank you for your foresight and your dedication. It is astonishing how much material you have gathered. Even more impressive is how well you have managed to organise and present all this material. I wish you all the best in continuing this wonderful work. Again, Thank you! The New York Cares organization, New York City's leading volunteer organization that each year enables 33,000 caring New Yorkers to volunteer at social service agencies, homeless shelters, public schools, and other deserving organizations, is auctioning an EMI-donated copy, signed by Robbie Robertson, of the 5-CD+DVD The Band box set A Musical History. You can support the New York Cares Holiday Auction and be the lucky owner of this (highly recommended) signed box set by visiting the New York Cares auction web page. "Bob Dylan Podcast - Episode 7: The Basement Tapes and Planet Waves are discussed with Garth Hudson and Anthony DeCurtis. Patti Smith hosts. Standard Podcast [8:15m] ... Producer: Joyride Media ... You can listen HERE." amazon.com has just posted their list of Best Folk Albums of 2007 -- guess who's the winner! Way to go, Levon! A release of Band interest is the new Four Men & A Dog album, Wallop The Spot. Tracks are described as "Jigs / Reels" "Polkas", "Songs" or "Melody", and it features excellent new songs from Kevin "Don't Wait" Doherty. FM&aD appeared with The Band in '96, and Band members played on their mid-90s albums Dr. A's Secret Remedies and Long Roads. Thanks to Peter V. for the update. TONIGHT! THE MATT ANGUS THING BIRTHDAY BASH at THE STANHOPE HOUSE - with special guests: GARTH HUDSON, BERNIE WORRELL, BERNARD PURDIE, JOHN GINTY, KATHY PHILLIPS, MEMBERS OF HARLEM GOSPEL CHOIR! To order tickets: stanhopehouse.com or call: 973-347-0458. Ask for the Dinner Package to guarantee a reserved seat! Show starts: 9:00 pm. Address: 45 Main St., Stanhope, New Jersey. The Hawk received a Special Achievement Award this year at the annual gala of the The Society of Composers Authors and Music Publishers of Canada. Way to go, Ronnie! Thanks to Susan Slinger for the info. Check out The Band's guitar maestro Jim Weider's web site for interesting news and new concert dates. A track from Levon's Dirt Farmer in included on the cover CD that comes with the December issue of UK magazine The Word. Thanks to Peter Viney for the info. A personal note: We're considering importing a '60s Karmann-Ghia from the US, and would like to get in touch with someone living in California (LA/Santa Rosa/Sacramento area) that knows a thing or two about vintage VWs. The interview with Garth Hudson by editor Simon Harper in UK's latest Clash Magazine issue (the one with all those juicy details from Garth and Maud about the long rumoured Levon and the Hawks box-set...) will be posted online a month after the pressing. The interview was done at the 100 Club in London on September 27th. The Levon Helm Band will be playing on the first WABC broadcast of the "new" Imus in the Morning show, live from Town Hall in New York City on Monday Morning, December 3, 2007 6:00AM to 10:00AM. For tickets and more details see imusranchfoods.com. The total ticket price of $100.00 will be donated to the Imus Ranch for Kids With Cancer. Subject Hubert, Levon & the fellas in Yonkers? The Nov 16 Entertainment Weekly has a pretty good article about Levon Helm with comments from Emmylou Harris, Robertson, Tommy Lee Jones & the Hawk (pages 36-40). Thanks to Paul Schoninger for the info. The latest issue of UK's Clash Magazine has a nice two-page Garth Hudson interview/article by editor Simon Harper, where Garth and Maud reveal some very interesting news about the long rumoured Levon and the Hawks box-set. New Levon Helm interview with John Donabie! "To say it is his best solo album is understating the case. It virtually wipes out all his previous solo albums as well as those by the reformed Band. It's the first album I've heard in ages that made me reach for the CD booklet to see who is playing what" -- from Peter Stone Brown's counterpunch.org review of Levon Helm's Dirt Farmer. "This Thanksgiving Day, November 22, WJZF radio in Standish Maine USA will be broadcasting a nine hour Band marathon! WJZF will be re-broadcasting all of the Mystery Train specials featuring The Band, back to back. The marathon will begin at 3:00pm and run through midnight EST. Join Mystery Train and WJZF in celebrating the music of The Band on Thanksgiving Day! Plenty of rare tracks, live sets, solo material from each member, and lots of Levon and the Hawks. Perfect for your Thanksgiving Day celebration! Mystery Train is hosted by Bob Reichers and can be heard anywhere in the world by logging onto wjzf.org." The "mystery" guitar player from the 1979 Danko/Butterfield gig (see Nov.10 update below) has been indentified. 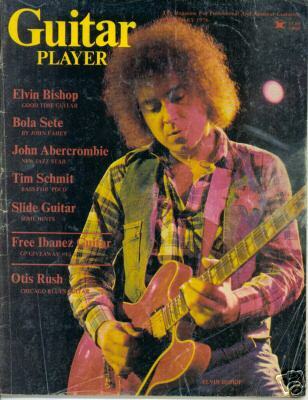 The guy must be Elvin Bishop, who did play with Butterfield, see this scan of a '70s Guitar Player mag. Thanks to Greg Groves for clearing it up. New Canadian November concert dates for Garth and Maud Hudson have just been posted at garthhudson.com. "Making music again: Legendary Levon's comeback album" -- great review of Dirt Farmer from the Times Herald-Record. featured on Piano and Organ. "Here Is What Is" is arguably the best rock 'n' roll film of 2007. The film opens with a magical performance on the piano by Canada's national treasure, Garth Hudson, who also appears elsewhere in the film on a few songs from Mr. Lanois' upcoming CD release. Brian Blade and Brian Eno have prominent appearances. There are also very special guest appearances by U2, Willie Nelson, Emmylou Harris, Aaron Neville, Billy Bob Thornton and Sinead O'Connor. The soundtrack album for the new Bob Dylan film I'm Not There includes a previously (officially) unreleased Basement Tapes recording with Dylan and The Band. New addition to the Band fans photo gallery: Richard Summers and Garth Hudson at the 100 Club in London in September. Levon's new CD Dirt Farmer is #1 this week on Billboard's Top Heatseekers. Video interview with Levon Helm telling the story of "The Midnight Rambles" to "Dirt Farmer". Two new Ramble dates added... November 24th and December 8th. Chris Bergson Band will be at the November 24th Ramble celebrating the release of Fall Changes. Recorded at Levon Helm Studios, featuring Jay Collins, Bruce Katz and Tony Leone. Ollabelle will be appearing at the December 8th Ramble. Loads of photos from the Midnight Rambles this fall are available from levonhelm.com. Deane Carter's new album The Chain has a cover of "The Weight". Deane's father, Nashville studio musician Fred Carter Jr who played with "our boys" in the Hawks in the early '60s and then again in the late '80s, contributes guitar on The Chain. Thanks to Dirk Mell for the update. Two European '70s albums, both with versions of "The Night They Drove Old Dixie Down," added to the to the list of covers of Band songs: Chanson de l'Eurovision (The Electronics, 1972), and Rock Me Gently: A Tribute to the Great Canadian Songwriters (James Last, 1975, with sound sample!). Thanks to Stephane Rebeschini and Peter Viney for the contributions. Check out these 1979 concert photos of "Paul Butterfield, Rick Danko and Friends" by Bob Sanderson. Can anyone help us identify the guitar player standing next to Butterfield? "Levon Helm & The Midnight Ramble with Special Guests" are part of the line up for next year's Merlefest, taking place on April 24-27, 2008, on the campus of Wilkes Community College, Wilkesboro, NC. Thanks to Dan Schram for the info. "Dirt Farmer stands as an exquisitely unvarnished monument to Americana from a man whose keening, lyrical vocals have become synonymous with it." -- from the review in Washington Post this week. Link submitted by Alex Hoffman. Singing "Listening to Levon" on Good Morning America, beautiful performance with a little bit of "Rag Mama Rag" at the end. Promo video where Cohn says in explaining "Listening to Levon" what an influence the Band and Levon were to him. Added two 2005 photos of the late Richard Bell. Thanks to Bill Munson for sending us these. Levon Helm's Dirt Farmer got four stars from Mark Edwards in a review in the Sunday Times last weekend. This is the highest circulation Sunday quality paper in the UK (about 2 million). Thanks to Peter Viney for the info. Three new photos of Robbie Robertson with Linda Evangilista. Contributed by Jerry Hallier. Added track list and more info for Arlen Roth's new album Toolin' Around Woodstock -- Featuring Levon Helm. New video interview with Levon Helm telling the story of the Midnight Rambles and Dirt Farmer, available from poughkeepsiejournal.com. New concert dates for Jim Weider. 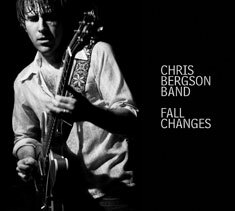 Singer, songwriter and guitarist Chris Bergson's band has a new album out titled Fall Changes. The album was recorded at Levon Helm Studios with several of the musicians from The Levon Helm Band sitting in, including the wonderful Amy Helm. Bergson has also been performing with Levon at the Midnight Rambles, and Levon and Amy are both credited with a "special thanks" on Fall Changes. The music is rootsy and funky, with strong vocals and guitar from Bergson and brilliant playing from the Chris Bergson band (Tony Leone on drums, Bruce Katz on B3 and piano, Jay Collins on sax and Chris Berger on bass). I particularly liked the opening track, an original titled "Gowanus Heights" and the inventive cover of Dylan's "When I Paint My Masterpiece". Highly recommended! Available from amazon.com. According to Garth and Maud Hudson, the release of the long-awaited 8-CD + DVD Levon and the Hawks Limited Edition Box Set From Bacon Fat to Judgement Day has not been cancelled. The box set is still in the works and will be released in a not-so-distant future. He-hey! Right now, Levon's Dirt Farmer is #10 on amazon.com's Music Bestsellers List! Tracks from Dirt Farmer are now available to purchase as MP3s. Enter to win a pair of tickets to Levon Helm's Midnight Ramble Sessions at his home studio in Woodstock, NY! New web site for Levon Helm's Dirt Farmer: dirtfarmermusic.com. Nice review of Dirt Farmer in the New York Times yesterday (scroll down a bit to read it). HAPPY HALLOWEEN! Please visit our Family Room and move your mouse over the icons while listening to the music. PRESS RELEASE (Hamilton): The Band will be honoured with the Lifetime Achievement Award next month at the 2007 Dofasco Hamilton Music Awards. Today is the official release date of Dirt Farmer. As of 9:15am it's #30 in the best seller list at Amazon. Can Dirt Farmer hit #1? Keep checking, if it hits in the top five and you make the post, we will send you a copy of Dirt Farmer. Here is the link. GOOD LUCK! Two new Ramble dates added: November 17th and December 8th. Levon Helm Studios is proud to announce The Alexis P. Suter Band Live at the Midnight Ramble CD/DVD on sale now! CBS News Video "Levon Helm's Life After Cancer". Complete video interview courtesy of CBS. Miss Anna Lee's cookbook in now in stock. You can pick up a copy when you are at a Ramble or email her direct (annalee@levonhelm.com). $25.00 includes shipping. Levon Helm sings and plays drums on guitar legend Arlen Roth's new album Toolin' Around Woodstock -- Featuring Levon Helm. See the press release for details. The Dutch Americana/country music website Hanx has elected Levon Helm's Dirt Farmer as best roots record of 2007. 4.5 stars out of five! Thanks to Rudy Veirman for the info. We're going to the US tonight, for an extended weekend in Woodstock, NY. Our trip is sponsored this time, by a major newspaper over here that's doing a story on Levon, the Rambles, the new album and The Band web site. Sammy Davis's poolhouse in the Hollywood Hills, where The Band recorded most of the the brown album, is for sale for $3,295,000. You can view photos of the property and take virtual tours around the house (Java-enabled web browser required) at the real estate agent's web site. Thanks to Lars Vingå for the info. David Fricke's Rolling Stone review. Paste Magazine review by Andy Whitman. "The Soul of Woodstock" -- review from the New York Magazine. Quote from the last paragraph: "Dirt Farmer is an iconic album, this year's Time Out of Mind or Freedom. Just give him a Grammy." On October 24th, KXCI 91.3 FM will air a special one-hour program on the career and legacy of Bob Dylan. The Oct. 24th "Like A Rolling Stone" episode includes interviews with Sean Wilentz, George Wein, Roger McGuinn, Anthony DeCurtis, Greil Marcus, John Hiatt, John Cohen, Ray Benson, Josh Ritter, Bill Flanagan and Garth Hudson. Each Wednesday starting October 17th, these extra-special broadcasts will be in the final hour of The Home Stretch, 5-6pm Wednesday (Tucson, Arizona time). The specials are hosted by the legendary Patti Smith. Amy Helm's band Ollabelle are currently working on their third album in a house in Athens, NY. You can read reports, see photos and listen to recordings from the sessions in the Ollabelle Blog. CBS News Online has now posted most of Levon Helm's interview with CBS Sunday News, that aired last week, on YouTube. A part of the TV interview with Levon Helm that aired on CBS Sunday Morning today, is now available from cbsnews.com (30 seconds of ads before the interview clip). Added more photos with Garth Hudson from the 09.14.2007 release party for Sarah Perrotta's album The Well. Photos provided by Sarah Perrotta. "The Making of Eliza's Horoscope" -- article about the 1970 film where Richard Manuel played a role as a "composer". Thanks to Lubin Bisson for the link. The 1983 Van Morrison/Robbie Robertson collaboration "Wonderful Remark" from the King of Comedy soundtrack, is available in a remastered version on the new Van Morrison 3CD-set Still On Top - The Greatest Hits. Check out the web site of The Band tribute group The "The Band" Band. They're playing at The Turning Point in Piermont, NY in November, a nice little club where Rick Danko and Levon Helm have performed several times in the past. Thanks to John Sorenson for the link. John Simon is interviewed by Pete Fornatale on his "Mixed Bag Radio" Show next Sunday morning, October 21st from 7 to 8 AM EST on WFUV-FM 90.7 (Fordham U. Radio, New York City). The interview includes John talking about meeting the members of The Band and his discussion about his collaboration with them on "Big Pink" and "The Band" albums. WFUV streams live at wfuv.org. Thanks to Rick S. for the info. "Go Back To Your Woods" -- a rather spectacular performance from Saturday Night Live 1992. CCR Rock Hall Of Fame Induction Jam 1 and Jam 2 -- Robbie and Bruce Springsteen with John Fogerty at Creedence Clearwater Revival's 1993 RHoF induction. Thanks to "Brown Eyed Girl" for posting these links in the "guestbook"
CBS Sunday Morning is doing a piece on Levon, Dirt Farmer and his comeback from cancer -- to air this Sunday, 9am east coast, USA time. Thanks to Nick Tovo for the info. New review by Peter Viney of Levon Helm's Dirt Farmer. 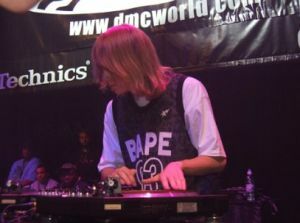 Our house DJ, young Final, represented Norway in the 2007 DJ World Championship this weekend. He was one of 12 DJs that got through the tough elimination round and on to the "superfinal" at the O2 Centre in London Sunday night, where he played a well-received set for the enthusiastic 3000+ crowd (including yours truly). In the end, he came in as #8, behind seasoned DJ-celebs from Germany, Japan, USA, UK, France and Canada, securing Norway's best result ever in this event -- we'll go for the Golden Turntables next year! Check out this rumor from Uncut editor Allan Jones -- look at tracks 3 & 6!! Too good to be true... but thanks to J. Katz for the link. Dirt Farmer is now one of the top 100 best selling CDs on Amazon! (#65 today). The Levon Helm Band will be performing at Gill's Farm Stand in Old Hurley, NY, on Sunday, October 28, from 3 to 5 p.m. Special music for kids by Ida. Free to the public. HAPPY THANKSGIVING TO ALL CANADIANS! Please visit the FAMILY ROOM for a musical celebration. This is the Wednesday Setlist and Thursday Setlist for the 100 Club Shows we did. It was a great success! Please visit MAUD WHISPERS & WAILS to read the rest of Maud's travelogue blog from their recent U.K. Concerts trip. "Happy birthday to The Band's Garth Hudson..." -- great review of the Hudsons' gig in London last week, by Uncut magazine's legendary editor Allan Jones. Robbie Robertson will be featured performing "Who Do You Love" with Eric Clapton during Clapton's second Crossroads Guitar Festival this summer, on a forthcoming 2-DVD set to be released on November 20 -- should be a killer... The DVD set has 38 tracks from the event that took place on July 28, 2007, outside Chicago. Read more at the Billboard web site. Thanks to Tom Wilk for the info. "New Ramble dates, November 10th and 17th. Tickets are still available for our 'Halloween Ramble' on October 27th. ORDER NOW! Take advantage of our 'Group Rate Ticket'. When you order 5 or more Ramble Tickets (at the same time) the price will be discounted $25.00 per person. So tell your friends and put together a group and see Levon Helm's The Midnight Ramble! New Midnight Ramble T-Shirts and Zipper, Hooded Sweatshirts with Levon Helm Studios Logo. ORDER NOW!" Added more photos of Maud Hudson to Roger Woods' review of the gig in London on Wednesday. From the Daily Freeman: "Turbine won't be blowin' in the wind near Big Pink". Thanks to Ed Gorham for the link. Added review and photos by Roger Woods from Garth and Maud Hudson's gig in London on Wednesday. Ian Margieson from the UK has written a new novel titled Woodstock - In the quiet morning. Set in 1969, the novel follows Irish music fan Joseph Morrison as he travels from his home in Belfast to the Woodstock Festival and then takes a road trip down through Tennessee, Mississippi and on to Texas. With its several Band references, as well as lots of references to other musicians of the day, the novel should be a very enjoyable read for anyone interested in The Band and the music of 1969. The novel is not yet published. The author is currently seeking representation by an agent or publisher. As a special treat to the fans of The Band, Woodstock - In the quiet morning will be available for downloading for a limited period from this web site. Enjoy. "Mystic Nights: The Making of Blonde on Blonde in Nashville." -- long, detailed article from Oxford American with info. about the Hawks'/Band's involvement in Dylan's 1966 masterpiece. Now available from Wolfgang's Vault: Levon Helm & the RCO All-Stars live in New Hampshire 7/2/77. Thanks to Dan Schimelpfenig for the link. Canadian DJ and radio host legend Paul Godfrey, personal friend and fan of Ronnie Hawkins, Levon Helm, The Hawks and The Band, and a long-time contributor to The Band web site, died today. May he rest in peace. Thank you, Paul. "Shine on." "Maud Whispers and Wails" -- check out what those Hudson's are up to in the UK these days! The official release date for Levon Helm's wonderful new album Dirt Farmer is October 30th. BUT, we just found out that the CD (not the tickets-shirt-CD package, but CD-only) already IS available for sale from levonhelm.com for $24.99! "This is the Setlist and Backup Band for the Truck 10 Festival we did. It was a great success!" Only one more day until Garth and Maud Hudson's first concert at the legendary 100 Club in London, UK. Our friend Simon Harper, editor of Clash Magazine, is doing an interview with Garth during their visit to London, in the afternoon of Wednesday 26th. Simon would like you, the web site visitors, to suggest questions to be put to Garth. You may send suggestions directly to Simon by e-mail. Garth Hudson is scheduled to give an interview on BBC Radio2 tonight on the "Mark Radcliffe & Stuart Maconie" show. Show starts at 20.00 GMT. The programme can be listened to live on the internet and should be made available for a week on the programme's website. Thanks to Doug Campbell for the news. The Rolling Stone web site today has a list of the "The Top 25 Music DVDs of All Time" -- guess which one is #1? Thanks to Dan Schimelpfenig for the link. Garth Hudson played at the release party for Sarah Perrotta's new album The Well on September 14th. Here's a photo from the event. The Band is present on the new 4-CD box Four Decades of Folk Rock. On Marc Cohn's new album there is a song titled "Listening to Levon." Here is an article explaining Marc's writing and the Levon Helm connection. Thanks to Lex Combs from Springdale, Arkansas, for the link. Stratford murals -- including one of Richard Manuel with the Revols. New photo of Robbie Robertson at Eric Clapton's Crossroads Guitar Festival in July available from ericclaptonphotos.com. Thanks to "Brown Eyed Girl" for today's photo links. Emanuele Marchiori from the Italian Band/Dylan tribute group The Beards has put up two songs on their web site of Rick Danko with Dylan's Rolling Thunder Revue, from the Hartford Concert in 1975: "It Makes No Difference" and "What a Town". The tour's off because Rick Danko's in jail in Japan for heroin. There's no explanation of why Zevon had to cancel a tour because of Rick's problems in Japan 10 years ago. Does anyone know what this is about? Carl likes to try to be a musician, although I think he'll be the first to admit he's one of the worst natural musicians in the history of the world. There's a reason there's not a lot of famous Norwegian rock stars. Added Dr. Ralf Bender's "square dance singing call" cover version of "The Night The Drove Old Dixie Down" to the list of covers of Band songs. Added the album Seul Avec Bruce (Bruce Huard, 1968) to the list of covers of Band songs. Thanks to Stephane Rebeschini for the information. "Halloween Ramble October 27th: Levon Helm Studios is asking everyone to bring a carved and/or decorated pumpkin (with candle) AND a bag of individually wrapped candy to the show. We are going to have a contest for best looking pumpkin. The winner will get two ramble tickets and a Dirt Farmer CD. The day after the Ramble we will donate the candy and pumpkins to the shops in Woodstock for their annual Halloween children's parade and trick or treat event." "Rick Danko 2nd Annual Tribute Concert" -- review by Nancy Dixon of the Danko tribute in Simcoe, Ontario, August 2007. Sound sample, cover art and track details added for the 1980 album Volunteer Jam VI, that has a rather decent live version of "Dixie" by Dobie Gray. Thanks to Peter Viney for the contribution. The music has been copied without permission. The artists and record companies do not receive any money from the sale of MP3s. Buying music from these Russian sites is a criminal act, the equivalent of buying stolen goods from illegal traders. The MP3 trade is run by the Russian mafia. If you input your credit card details into one of these web sites, you're at high risk of becoming a victim of credit card fraud. Great new photos of Levon Helm portraying General John Bell Hood in Tommy Lee Jones' new film In the Electric Mist are now available from levonhelm.com. "The best thing about Dirt Farmer is that it's not a good album for a guy coming back from throat cancer; it's a good album, period. It might be the first solo disc that Levon Helm has put out since he started going through treatment for his illness, but what I heard was a recording made by a man with a great deal of integrity - and a love for the music that he sings. That makes it a heck of lot better then most discs being released in this day and age." Thanks to "Brown Eyed Girl" for posting this one and other Band-related links in the "guestbook". 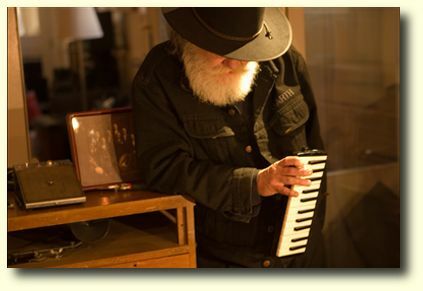 Garth Hudson plays on the new album Picture Book by Luke Powers. Thanks to Jonathan Katz for the info. Sound samples from all tracks on Levon Helm's wonderful new CD Dirt Farmer are now available from amazon.com! Thanks to Rudy Veirman for the tip. Concerning the Sept 13, 2007 update, unfortunately Mr. Lyle Lovett was incorrect in his explanation of the origins of "Ain't No More Cane on the Brazos," when he said "The prisoners were actually making fun of the guards and the situation as there 'was no more Cane on the Brazos' river; because it didn't even grow there. Just cotton". Sugarcane was grown not only on the Texas prison farms on the North bank of the Brazos River in Fort Bend County, but also on the many antebellum plantations in the county. In 1843 the first sugar mill was commissioned in what later became Sugar Land, Texas by one of the original 100 families that Stephen F. Austin brought to Texas. Samuel Williams' sugar crop on the Oakland Plantation was large enough to justify the installation of a commercial raw sugar grinding mill. By 1855, in the surrounding areas of the Oakland Plantation, sugarcane had replaced cotton as the dominant crop. Fort Bend county, Texas, was home to many sugar plantations, and sugar was a mainstay of the local economy from the mid 19th Century. At least one of these plantations, the Ellis Plantation, survived the American Civil War. In 1852 Colonel Benjamin Terry and William Kyle purchased the 5058 Hectare Oakland Plantation, and became successful sugar planters. Col. Terry's Texas Rangers (8th Texas Cavaly) was a famous Texas unit that fought for the Confederacy. The Oakland Plantation later passed to Colonel Cunningham, who developed the town of Sugar Land around his sugar refining plant in 1879. The Cunningham plantation, with its raw sugar mill and sugarcane refinery, was acquired by the Ellis plantation, which had been operated by tenant farmers after the war under the management of William Ellis. The partnership changed its name to Imperial Sugar Company, and the town of Sugar Land was a company town until 1959. The Sugar Land and Richmond area is also the home of several Texas State Prisons. Along Highway 90 there are signs posted that read "Prison Area - Do Not Pick Up Hitchhikers". Prisoners may still be seen being taken to work the fields in tractor-pulled wagons. The prison work gangs worked the sugar fields in the Brazos River valley of Fort Bend county, along the North banks of El Rio de los Brazos de Dios, the River of the Arms of God. The Jester State Prison Farm (now Jester I), located on Highway 90A between Sugar Land and Richmond, Texas, was established in 1885 as the Harlem Prison Farm, and was worked by convict labor, harvesting not only cotton, but sugarcane. Prison officials established a spur track of the Galveston, Harrisburg and San Antonio Railway to load and transport the sugarcane cultivated on the prison grounds, but the line was abandoned in 1929. In addition to raising sugarcane, prisoners also operated a brick plant. In the 1950s the name of the facility was changed to Jester State Prison Farm, for Governor Beauford H. Jester. The convicts of Jester Prison farmed sugarcane until the early 20th Century, when most of the sugarcane crops were destroyed by a harsh winter. Cotton continues to be a staple of the agricultural economy in Fort Bend County. Handbook of Texas Online - Jester State Prison Farm. Texas Department of Criminal Justice - Jester I Unit. Imperial Sugar Company - History. "I have been listening to 'Ain't No More Cane,' a traditional song sung by The Band on the Basement Tapes; since it came out. I will admit to not knowing the whole story behind this piece of music. On the new Lyle Lovett double CD/DVD It's Not Big It's Large he explains its origins (800K) as he rehearses it on the DVD portion. I knew it was a Texas Chain Gang work song and that was it. I found it very enlightening and now fully realize why it was written during those times. The prisoners were actually making fun of the guards and the situation as there 'was no more Cane on the Brazos' river; because it didn't even grow there. Just cotton." "Richard Bell tribute" -- video that was played at the memorial in Toronto for Richard Bell earlier this year. Thanks to our friend John Donabie for the link. Added photos of Richard Manuel with the (Rockin') Revols from 1957, 1958 and 1979. Lifted from Wikipedia. You may want to check out the new album from Ed Orso's heavily The Band-influenced group Revival Dear. Good country music from Toronto, Ontario, Canada. Updated the list of "The Band Cover Versions from the GB" with a cover of "I Shall Be Released" by "C & C", aka Carles Canals and Juan Pablo Caja, from Spain. New "BandBite" from Carol Caffin: "David Fishof talks about The Band, the Ringo Starr tour, and the Columbia Records deal". New September concert dates for Jim Weider. 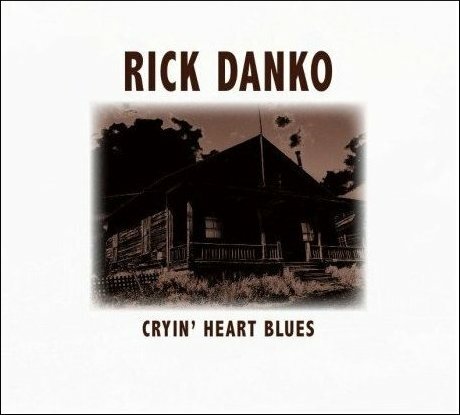 The Rick Danko album Cryin' Heart Blues was released in Holland by Corazong Records in June, with new cover art. Thanks to "Deb" for posting this info. in the new "guestbook". New Midnight Ramble dates and musical guests announced at levonhelm.com. "Guitarist's musical dexterity Leads fans to Ramble: Larry Campbell rides into town for another Helm get-together " -- article from yesterday's Poughkeepsie Journal. New tunes ("Time To Kill," "The Night They Drove Old Dixie Down") and new tour dates from Kris Gloer's The Last Waltz Ensemble. "GARTH HUDSON will be joining DANIEL LANOIS, Brian Blade and others in concert! The world premiere of Daniel Lanois' feature film HERE IS WHAT IS on Sunday night (Sept. 9) at the Toronto International Film Festival will be followed by two Lanois performances at THE GREAT HALL in Toronto on Sept. 10 and 11. The new Lanois disc likely will be called Here Is What Is -- based on the Jamaican proverb "don't look to tomorrow, look to right now," explained Lanois -- and released next March. Garth is in the film and on four tracks of the album. Tickets for the concerts are available at all Ticketmaster outlets or by calling (416) 870-8000 or online at www.ticketmaster.ca." I went to this show with my colleagues from Fairport. We were already fans of The Band from their first couple of albums. We loved them for their rootsiness, they seamlessly blended Americana styles -- blues, country, rock, R&B, Appalachian -- and regurgitated it with their own unique sound. Live, the musicianship was even more apparent. They had three lead singers, a killer rhythm section in Danko and Helm, one of the great guitarists in Robbie Robertson (see him wipe the floor with Clapton in The Last Waltz) and presiding over proceeedings, on a riser at the back, Garth Hudson, who eschewed the Hammond organ in favour of the more distinctive Lowrey with its 'glide' effect. They played superbly with great balance. Arrangements were mostly as per record, except at the encore. At one point during 'Chest Fever,' Garth switched the organ output to a speaker at the back of the hall. Surround sound in 1971! I saw The Band a couple of times more, but never again from such a good seat (we were right across from the stage in the lower loggia). And the first time is usually the one that slays you with all that sensory input. There was considerable cultural impact for us, too -- these guys had short hair and suits, totally against the styles of the day -- quite refreshing. Thanks to Peter Viney for the info. From the Poughkeepsie Journal this Friday: "Former manager of The Band to run for New Paltz justice". Go get'em Butchie! The New York Times mentions Levon's new album today: "A Band Member Returns to Recording". Elliott Landy's photo exhibit in our little burg is now over. We bought a beautiful high-quality print of this late '60s photo of Ricky. It was framed today and is now hanging in the "Band-section" of our living room. "Levon Helm Battles Back From Cancer and Tragedy, Returns With His First New Studio LP In Twenty-Five Years" -- from rollingstone.com. "Coming attractions: Helm finally unearths 'Dirt Farmer'" -- from usatoday.com. Jazz News: "Levon Helm: First Solo Studio Album In 25 Years". "The Band's Levon Helm to Release First Album in 25 Years" -- from spinner.com. Harp Magazine: "The Band's Levon Helm w/Solo Album For Oct. 30". New, updated version of the article on the different releases of The Last Waltz by Dror Warschawski and Jonathan Katz, including the audio-DVD version. "Panic! At the Disco: 'The Weight'" -- YouTube video from the Reading/Leeds festival 07.10.2007. Thanks to Dave Naughton for the link. I got my hands on a very-far-in-advance copy of Dirt Farmer, the first new album from former Band drummer, vocalist and current Woodstock resident Levon Helm. I've listened to it four times and I am overwhelmed by the genuine-ness of this collection. The thing that stands out the most, above everything else... are the harmonies. First off, you have Levon, whose voice, more than anything else about The Band, defined this ensemble's very existence: "The Weight," "The Night They Drove Old Dixie Down" and "Up On Cripple Creek" are built around Levon's vocals. Now, on Dirt Farmer, you have Levon's signature sound, which is as about as genuine, human and humble as you will find in modern rock 'n' roll. Then, you have the other-worldly, angelic and atmospheric vocals of Teresa Williams, who is married to former Bob Dylan sideman Larry Campbell; and Amy Helm, who is Levon's daughter. Between Levon, Amy and Teresa, the vocals launch like a rocket. These human voices sound like a pipe organ. Also, I see at least two hits on this record - "Married Girl" and "I Got Me A Woman," the latter of which features Bob Dylan's current drummer, George Receli, on percussion. More to come on this. New "BandBite" from Carol Caffin: "An Interview with Jonathan Taplin". "GARTH and MAUD are performing two nights at the 100 CLUB LONDON in England on Wednesday September 26th and Thursday the 27th. Backed by their TRUCK FESTIVAL friends GOLDRUSH with Danny George Wilson and Julian Wilson of GRAND DRIVE. There will be more THE BAND songs performed than previous shows along with Mr. Hudson's own compositions and Goldrush and Grand Drive for a great time! Spread the word by telling everyone you do and don't know for a big turnout! We are testing the waters in UK, so come jump into our continuing celebrations for Garth's 70th year!!! Tickets: http://www.wegottickets.co.uk." Check out the home page of levonhelm.com for a nice little Flash animation with sound samples from Levon's new solo album. Garth and Maud Hudson with Danny & Julian Wilson of Grand Drive, backed by Goldrush, will play the legendary 100 Club in London, UK, on September 26th and 27th: "Garth Hudson brings his friends and his own music full of suprises for a special evening with The Band songs. Garth's 70th birthday celebrations continue..."
Levon Helm's new album Dirt Farmer will be released to the public on October 30, through Dirt Farmer Music LLC in conjunction with Vanguard Records. But to mark this milestone in his career, Levon will offer his longtime supporters and fans the opportunity to purchase it six weeks early through a limited edition offer at the LHS website. The $300 package will include one of 1,000 numbered Dirt Farmer CDs, a Dirt Farmer T-shirt, and two Midnight Ramble tickets. Garth Hudson, 2006. Photo by Rick Gilbert. "Garth was recording at the Clubhouse recording studio in Rhinebeck (a year or so ago) with Rick Gilbert for his film Hammond Heroes (still in production). Mr. Gilbert took a few photographs during the session. One of the photographs is included in his show in the Solo Gallery at the Woodstock Artists Association & Museum. It opened last weekend (August 11th) and will run through August 26th. Sorry not to let you know sooner. This photo was also used on the invitations." Sid Griffin's new book Million Dollar Bash: Bob Dylan, The Band, and the Basement Tapes will be released next month. Griffin is a US-born musician, musicologist, author and broadcaster, now living in the UK. For more about the author, see sidgriffin.com. Updated the list of "The Band Cover Versions from the GB" with a cover of "It Makes No Difference" by South African musician and producer Nux Schwartz, plus a version of "Cryin' Heart Blues" by Nux and his '90s band Scooters Union. Our friend Mark Atkins has informed us that there is an unofficial DVD release of the video The Band: Japan Tour '83 out there. "Daniel Lanois' new film, Here Is What Is premieres at the Toronto International Film Festival in September, featuring appearances by actor/singer Billy Bob Thornton, The Band's Garth Hudson, Willie Nelson, U2, Sinead O'Connor, Aaron Neville and Emmyloy Harris, among others. The feature-length film documents Lanois on trips to Morocco (where he was recording with Eno and U2) and Shreveport, LA. (with drummer Brian Blade and his father's powerful gospel singing), and captures a rare and intimate piano performance from Garth Hudson (who was working with Daniel on his latest not-released-yet album). Here Is What Is is a dissection of Mr. Lanois' creative process as a producer, composer and songwriter. The film reveals the mental legwork behind his collaborations with the likes of Peter Gabriel, Bob Dylan and U2. Adam Vollick's cinematography involves you in the creative process in an unforgettable experience. Kudos to Daniel Lanois, Adam Vollick, and Adam Samuels." A Here Is What Is trailer is available from Lanois' web site. "Listening to [Garth Hudson's] accomplished playing of jazz, blues and classical music, I feel like we've dipped our hands in the river of American music and felt the disparate streams of the last 90 years swirl around our digits..." -- from a review of The Alternative Truck Weekend Festival in the UK in July, featuring Garth and Maud Hudson. Waylon Jennings' 2000 live CD Never Say Die was re-released in July 2007, with a live cover of "The Weight" as one of the bonus tracks. Thanks to Tom Wilk for the info. Now available from levonhelm.com: Women's Levon Helm Band tank tops and Levon Helm Band posters. Check out these great photos of Amy Helm and Ollabelle, from a concert in Stanhope, NJ, yesterday. Added pages for the new various-artists CDs This is Truck, featuring Garth and Maud Hudson, and Goin' Home: A Tribute to Fats Domino, featuring Robertson, and a "new" Dutch The Band compilation titled The Collection. Info. and cover scans by Peter Viney. Our friend Joe Lore has sent us scans of the ticket for the Levon Helm Bands gig in Central Park in June, and an access-all-areas pass from the recent Ramble on the Road in Nashville, TN. Both added to the posters, tickets and memorabilia gallery. 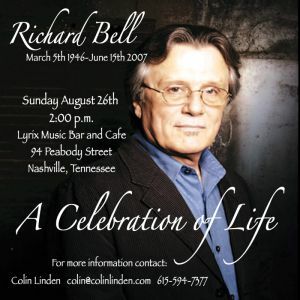 There will be a Richard Bell memorial concert in Nashville, TN, on Sunday August 26th, see the concert poster for more. Thanks to Kris Gloer of The Last Waltz Ensemble for informing us about this event. New concert dates for Levon Helm and Jim Weider. Here is the trailer to my film, Woodstock...Can't Get There From Here. The film charts the rise of the artists' colony of Woodstock, beginning in 1902, and continuing on until modern times. There is a section in the film on Bob Dylan's hiatus in Woodstock, another devoted to The Band, and a third section features members of The Blues Magoos and other rockers talking about the town during its heyday. Other sections of the film featured music by Mercury Rev and Tom Pacheco. Readers of your site may be interested in other clips I have on YouTube, including the newest clip from my latest film, Crazy Assed White Boy, of which the background music was contributed by Mercury Rev, "The Dark Is Rising." Mercury Rev are slated to write three other original songs for the new film. Patrick Watson of Montreal, Canada, a nominee for Best New Artist at The Juno Awards this year, wrote the music for the trailer for Woodstock...Can't Get There From Here. He's absolutely amazing. His website is patrickwatson.net. "Richard Bell Discography," by Peter Viney. Added Roger Woods' photos from Garth and Maud Hudson's concert at the Alternative Truck Festival Benefit in the UK in July. Check out Cathy's photos from the concert with the Levon Helm Band in Nashville, TN on July 18, 2007. A concert with Levon Helm and The RCO All Stars at the Superdome in New Orleans, LA, 02/07/1978, is now available from wolfgangsvault.com. You have to register as a member to listen to these live recordings. Thanks to Dan Schimelpfenig for the link. "Garth and Maud confirmed to headline the closing show at TRUCK 10 on Sunday, September 23rd. THERE WILL BE AROUND 700 REISSUED TICKETS AVAILABLE SOON FOR THE RESCHEDULED EVENT. To be the first to find out how to get them, make sure you have registered here. 90% of the July lineup will be appearing, with a few changes to be confirmed, including some notable new additions. Thanks to all those who had tickets for the postponed Truck Festival on July 21-22 and can't make the rescheduled festival the weekend of September 22-23 and have promptly sent back their tickets. Refunds will be posted out at the end of next week when the treasurer returns from holiday." "...after doing this [Crossroads Guitar Festival] here in Chicago, I don't want to do anything for a while. Robbie and I will probably kick some things around. And that probably won't even start till next year." -- from a new interview with Eric Clapton, published in the Chicago Tribune. Thanks to Ian Woodward and Peter Viney for the link. HAPPY 70TH BIRTHDAY GARTH!!! Please visit the FAMILY ROOM for a musical celebration. "Gord's Gold for Thursday!" A birthday salute to Garth from Gord James and the James Gang's "Morning Show" at 1050 CHUM in Toronto today. Thank you Gord! It's Garth Hudson's 70th birthday today! Our best wishes to Garth and Maud on his big day. The Truck Festival website confirms that Garth and Maud are returning to the re-scheduled festival on the Hill Farm in Steventon, UK, on September 22nd and 23rd. Once more they're booked to close the Festival. Photos from the Levon Helm Band's July concerts in Bethel, NY and Nashville, TN are now available from levonhelm.com. "ONLY A FEW COPIES LEFT! Truckers don't need to hold on until September's re-arranged Truck to add a copy of this year's This Is Truck Festival CD to your collection. The CD includes Brakes (as Hamilton Vs Hamilton) with their song about Truck 'Up On Hill Farm'. As a special offer (ending 8.8.2007), you can buy a copy of the CD + a free copy of the Truck 2007 Magazine which Plan B helped us to put together. We've got a feature on GARTH HUDSON by John Niven, articles on the Truck ethos by founder Robin Bennett, Grand Drive interviewed by Thilini Gunaratna, Electric Soft Parade talking to J Capeling and we wax lyrical on Blood Red Shoes, Euros Childs, Idlewild. Emma Pollock from Chemikal Underground and The Delgados talks to Rebecca Gilleron and Nathaniel Cramp talks Brian Jonestown Massacre." Added photos and short sound clips from Robbie's performance with Eric Clapton at the Crossroads Guitar Fest on Saturday. Thanks to Jonathan Katz for the audio files. "Laszlo Kovacs, Cinematographer, Dies at 74" -- article from the NY Times about The Last Waltz photographer Kovacs. Thanks to Daniel Schimelpfenig for the link. Robbie Robertson is performing at Eric Clapton's second Crossroads Guitar Festival today, at Toyota Park in Bridgeville, Illinois. Live(!) streaming video from the gig is available from msn.com now. New, updated version of the article on the different releases of The Last Waltz by Dror Warschawski and Jonathan Katz. The Richard Manuel live album Whispering Pines has been released in Holland by Corazong Records, with new cover art and new liner notes by Bert de Ruiter. Thanks to "Ragtime" for info and cover scans. "The Midnight Ramble Lives On" -- new article by Kay Cordtz. "Nashville recording star drops by Simcoe to headline a tribute to late friend Rick Danko" -- article from the Brantford Expositor about Colin Linden and next week's Rick tribute concert. Thanks to Carol Caffin for the link. Please be aware of people selling autographed merchandise through on-line auctions without authentication from Levon Helm Studios. Buyers beware! Levon Helm's Kid's Ramble with Ollabelle and Rowland's Ramblin' Family Band ~ August 25th, 2 - 4pm. "Garth and Maud Hudson with Goldrush" -- review by Peter Viney of yesterday's concert in the UK. "Levon Helm Joined by Crow, Hiatt and Harris in Nashville" -- review from cmt.com of the Levon Helm Band's 07.18.2007 concert. Thanks to Freddie Bateh for the link. "Levon Helm resurrects American classics on Bethel Woods stage" -- concert review from yesterday's on-line edition of the Times Herald-Record. Thanks to Rick S. for the link. "It Makes No Difference" -- YouTube concert video of Rick Danko, live in Japan in 1997. Thanks to John Mcpheator from Scotland for the link. "New Generation Hops the Mystery Train" -- article about Levon Helm, published in the New York Times today. Thanks to Daniel Schimelpfenig for the link. Prisoners of 2nd Avenue: Jimmy Vivino, Rich Pagano, Brian Mitchell & Mike Merritt. With: Professor Louie & the Crowmatix, Aaron Hurwitz, Mike Falzerano & Buddy Cage (of New Riders), Larry Packer and other special guests. Photos by Elliot Landy. Narration by R. Faust. $35 advance, $50 VIP includes 4:30pm soundcheck, reserved booth seats. Thanks to Jeff for the info. Photos from "The Ramble On The Road" at the Summer Stage in Central Park, New York City, June 28, 2007, are now available from levonhelm.com. Jim Weider just finished doing all the guitar parts on Canadian recording artist Dean Batsone's new CD, recorded at The Clubhouse in Rheinbeck NY. Jim just produced a new CD by John Franklin called Protest in PA. The Five Blind Boys of Alabama are recording two of Jim's songs co-written with Colin Linden and Jim Tullio now in the studio in Atlanta, GA.
Jim Weider's Project Percolator will be touring Colorado in August. New tour dates posted at jimweider.com. Jim Weider's song "Big Foot" will be in a new indie movie called Fat Girls and will be heard on an MTV special of that movie. Please check out festivalink.net for a live download of the show at Boothba, Maine. An English translation of the French interview with Garth and Maud Hudson published two days ago in Le Devoir, is now available from garthhudson.com. "Today's Discoveries: Jemima Surrender" -- blog/article from "The Lefsetz Letter". Thanks to Peter and Timothy for the link. We just found out that our ISP's spam-filter has been over-active again, filtering out several mails from fans and web site contributors over the last few weeks. We'll try to recover all deleted e-mail and will reply eventually. "Entrevue avec Garth et Maud Hudson -- Le doux génie du Band est heureux: il crée" -- article/interview in French from yesterday's edition of Montréal newspaper Le Devoir, with a nice shot of Garth and Maud. "Eric Clapton's second Crossroads Guitar Festival is just weeks away, taking place on Saturday 28 July at Toyota Park. Toyota Park is located in Bridgeville, Illinois, southwest of Downtown Chicago. Tickets went on sale in March and sold out in record time. The day-long event will feature Eric Clapton, Steve Winwood, BB King, Willie Nelson, Jeff Beck, Vince Gill, Sheryl Crow, Buddy Guy, John Mayer and more. Recently added to the list are Robbie Robertson, Johnny Winter and U.S. comedian / actor, Bill Murray." Thanks to Mike Koehler from Yesterday's News for the link. "Long on Nerve: An Interview with Ronnie Hawkins" -- 2002 interview with the Hawk, first published in 2006. Thanks to the author, Robert Cochran, the editor of The Arkansas Historical Quarterly, Patrick Williams, the director of the Pryor Center for Arkansas Oral and Visual History at the University of Arkansas, Kris Katrosh, and the head of Research Services and Special Collections at the University of Arkansas Libraries, Andrea Cantrell, for giving us permission to publish the interview at The Band web site. Also thanks to Linda Q. and Amanda J. for helping us with the typing. "Levon Helm, Central Park SummerStage, New York, NY, 6/28/07" -- review from Relix magazine. Photos from Levon Helm's Midnight Ramble, June 16, 2007, are now available from levonhelm.com. From YouTube: "Paul Butterfield Biography" - a video teaser for a documentary-in-progress by the Paul Butterfield Fund & Society. Thanks to "Rollie" for the link. "Classic Tracks: The Band 'The Night They Drove Old Dixie Down'" - October 2006 article from Sound on Sound about the recording of "Dixie" and the Brown Album. Thanks to Tim Wood for the link. Updated the list of "The Band Cover Versions from the GB" with a cover of "I Shall Be Released" by "Anton, Moa & Nicklas". "I attended the Levon Helm Band's show at The Egg in Albany last Friday and it was incredible! The musicianship of all of the members of Levon's band is unmatched. The obvious joy with which Levon performs set the tone for the entire evening and Levon is an incredible drummer. Every time he sat behind his kit, those drums snapped! From the moment Levon launched into the opener, 'Slippin and Slidin'' through the encore, there were people dancing in the aisles. Practically every moment between songs was filled with audience members screaming Levon's name. 'Ophelia' had the entire audience on its feet. Larry Campbell's performance of the introduction to 'Chest Fever' on his guitar was a highlight as was Jimmy Vivino's performance of 'Tears of Rage'. Levon's performance of 'Rag Mama Rag' and 'The Weight' were awesome. The band members switching instruments (piano to piano accordian, Larry Campbell guitar to fiddle, Levon drums to mandolin) truly brought forth the spirit of The Band. The band also included standup bass, piano accordion, piano, mouthharp, a 4 horn section, organ, fiddle, two guitars, mandolin, the members of Olabelle providing background harmonies and, of course, drums. The opening act, Olabelle, also performed a great set. When the three women from Olabelle performed a three part harmony of 'Bluebirds' accompanied only by Larry Campbell on the fiddle, the entire audience had shivers running up and down their spine. Little Sammy Davis's performance on the harp really got the blood pumping. I recommend that anyone who loves music go see the Levon Helm Band! It is an unmatched experience! Thank you Mr. Helm." Robbie Robertson is among 71 new appointees to the Order of Canada , announced Friday by Gov. Gen. Michaelle Jean. GARTH and MAUD are honored to be participating at TRUCK 10... the 10th Anniversary of the Truck Festival in Oxford, England on July 21st and 22nd. Duo, Solo, including a few The Band songs with members of Goldrush, and others. It will be a great finale to a special weekend at Hill Farm. This event is especially dear to the Hudsons because of it's shining example of how a small festival can benefit several charities by bringing thousands of people together to enjoy many genres of music. Always a good formula for happiness! It will be documented. FESTIVAL IS SOLD OUT. Thank you! "Here's a new video that was just put on MSN today. I've always known that Eric Clapton credited The Band with changing his musical direction, but here he really spells it out in under two minutes." Jim Weider and maybe Garth Hudson will be interviewed on The Band Marathon radio show tomorrow, on 88.3FM The Sting - Cleveland, Ohio. There will be 18 Hours of Band music - 7am-1am EST, online stream at wbwc.com (realaudio 8 and up). "The Hudsons are presently rehearsing with 3 of The Best! (Marty Ballou, Ernie Colon, and Steve Sacco) for the 'Savoir-Faire at Le Savoy' 70th-birthday kick-off... their July 4th indoor (air-conditioned) concert at the Montréal International Jazz Festival, or rather Festival International de Jazz de Montréal. Please see CALENDAR for details and ticket info." In Honor of Richard Bell: Bill Scheele, who's been working with The Band since 1969, has sent us a 1992 photo of Garth and Richard Bell. "The Band: Album Ratings and Chart Placings" -- new list compiled by Peter Viney. "Dazzling keyboard artist found a place in rock 'n' roll history" -- definitive article on Richard Bell in yesterday's Globe & Mail. Thanks to John Donabie for the link. We just got permission from the University of Arkansas to publish a recent interview with the Hawk. We need some help, though, with typing in about 12 pages of text. Any volunteers? E-mail us and we'll send PDF scans of the pages to be typed. Thanks. "Richard Bell was true musician's musician" -- article/tribute by Greg Quill, from ejazznews.com. Thanks to Peter, Ian and Butchie for pointing us to this one. Added three photos of Richard Bell, sent to us by The '90s Band's road manager Butch Dener. New addition to the Band fans photo gallery: Joe and Natalie's pics from their Woodstock and Levon's May 26th Birthday Ramble experience. "Here is cut 3 from Let's Frolic Again from Blackie & The Rodeo Kings. When I heard the solo and knowing that Garth played on the album, I just assumed it was Garth. I checked with Colin Linden and it is indeed Richard Bell. Richard told me more than once that there are musicians... and then there is Garth. He loved the man. This solo will remind us of the Basement Tapes sound that Garth brought us... but it's Richard. Have a listen." "This photo harkens back to a better time for the young men involved with the Reformed Band"
Hudson Valley songwriter, vocalist and pianist Sarah Perrotta's new album The Well was recorded at Leopard Studio in Stone Ridge, New York, January through March of 2007. Garth Hudson plays accordion on two tracks: "Out of Grace" and "Carry You Home". The album also features legendary bassist Tony Levin on all eleven tracks. The Well is due to be released in August of 2007. Here are a couple of photos of Garth at Leopard Studio in February. More information about Sarah Perrotta and her band, plus audio samples where you can hear Garth's accordion wizardry, available from Perrotta's MySpace page. "Levon Helm Studios would like to offer a Midnight Ramble 'special deal.' Anyone purchasing tickets to any of the New York Shows (Central Park on June 28th, The Egg on June 29th or Bethel Woods on July 14) will be eligible for the 'deal'. If they purchase tickets to any of those shows, we will allow them to purchase one Ramble ticket (for any show in August or September) at full price and get the second ticket at half price. They would have to email our web master (tony@levonhelm.com) or our office manager, Geanine (merch@levonhelm.com) to receive the special discount." Happy Father's Day from Garth & Maud! "Garth's dad still inspires" -- new article from The London Free Press. Thanks to Maud for sending us the link. "David Munyon - Song for Danko" -- video posted on YouTube in May. Link provided by Jan Janssen at the Real Roots Cafe. "Weighty recognition: C.F. Martin & Co. honoring songwriter with special guitars" -- article from Allentown, PA, newspaper The Morning Call, about two new signature-model Martin guitars honoring Robbie Robertson. Thanks to Peter Chomka for the link. Terry Danko, James Atkinson,(Bearfoot), with special guest, Duane Rutter. You can call for tickets at the Simcoe Information Centre at 519-426-6655. Richard Bell, The Band's brilliant keyboard player in the '90s and a member of Janis Joplin's Full Tilt Boogie Band in the early '70s, passed away today. May you rest in peace. New "BandBite" from Carol Caffin: "A Conversation with Jonas Fjeld". "In The Spotlight" -- concert review of The Last Waltz Ensemble, State Theatre, Falls Church, VA, June 10, 2007. Thanks to Daniel Rosenthal for the link. Levon Helm has recently recorded in NYC for The Congo Square Project to benefit musicians in New Orleans, here are some session photos. The project is planning to release a double CD with African-inspired music, including a "drum suite" with performances from an incredible array of top drummers. Congo Square, btw, is a gathering place for musicians and artists located in the Louis Armstrong Park in New Orleans, see Wikipedia for more info. The concert with Jim Weider's ProJECT PERCoLATor at the Milford Music Festival in Ann St. Park, Milford, PA, June 10,2007, is now available as streaming audio from Notoriety Productions' home page at MySpace. This is great stuff, thanks to Jim Weider for the link. Garth Hudson plays keyboards on Christian Kiefer's new album Dogs & Donkeys, to be released at the end of this month. Thanks to "Brown Eyed Girl" for the update. New web server statistics created from last week's log files. In 2006 we had a significant dip in server traffic for the first time in 12 years. This time we see a sharp increase. The traffic is back at 2005 level, probably thanks to Levon Helm's "comeback" with the Midnight Rambles and the New York concerts in March. The average number of requests for pages per day has gone from 32,000 to 40,000, whereas the average total number of file requests per day is approaching 280,000. The traffic volume last week is a new record for The Band site: Average data transferred per day was as an incredible 51.240 Gbytes! "Garth sat-in on accordion with the Cowboy Junkies last night (Sat.) at the Bearsville Theater and is looking forward to sitting-in with them at the Montreal Jazz Festival on July 2nd... two days before his own concert on July 4th." Photos from Levon's Birthday Ramble, May 26, 2007, are now available from levonhelm.com. The Band's photographer Elliott Landy is coming to this web site's home turf in August! Three members of Garth's Band THE BEST! are joining Garth and Maud at the Montreal Jazz Festival on July 4th. Marty Ballou, bass / Ernie Colon, drums / Steve Sacco, percussion. This will be a lively and fun kick-off for Garth's 70th year! See CALENDAR for info. Levon Helm Studios will host a "Workin' Man's Ramble" on June 9th, beginning at 7 p.m. Music will be performed by and produced by the legendary Larry Campbell and will feature local, accomplished talent and some accoustic music by Levon Helm. Tickets will be $30 each and are available through www.levonhelm.com. This is Levon's way of recognizing local talent and showing his appreciation of "the workin' man". Space will be limited so you should confirm your reservation ASAP. We'll have the grill hot so if they want to, the attendees can bring their burgers or dogs to cook up. "The Ramble on June 2nd was magical. It was so special that Gillian Welch and David Rawlings were there to perform. She was a perfect fit and was a fine example how a new generation of musicians can capture and appreciate the same musical sensibilities and traditions that we have all come to love during your legacy. I hope that future Rambles will have more guest artists that continue to reinforce that this wheel is still on fire!" "Levon, you were the host of one of the greatest musical experiences I have had in my life! Going to the Ramble is like going to the Church of Mountain Music. Dogs walking across the stage, friendly people from all over, the greatest music and musicians you could possibly get into an incredibly intimate room, doors open, lightning, thunder, rain... It was magic!!! What a special treat to meet Gillian Welch and David Rawlings too! They fit right in and Levon you should keep asking them to move to Woodstock from Nashville, because they fit right into the special moment. I guess what made the night so special for me was that I with my two good buddies and we wanted to make this pilgrimage to the Mecca of Music for 2 years! We're slow but we made it! Secondly I was going to see a man I have admired for over 30 years. My father used to see Levon with The Hawk at the Concorde Tavern in Toronto ALL the time. He loved their music and said they were the wildest bunch of folks he believes he ever met! If you have not been to a Ramble, you should jump on board as soon as you can. You can't forget it, you won't regret it, The Levon Medicine show... Cures what ails ya!!" "Oh, man, where to start to descibe one of the most magical evenings of my life? First after a 3am arrival in Woodstock, then a torrential downpour and slogging through mud to get to the "Barn", and then.....the magic began. I never expected to ever get to New York, much less to a Midnight Ramble and get to meet one of my all time heroes, and then to get to shake the hand of Levon Helm himself......I was speechless! (and this ol' gal is never without words! )It's really hard to descibe the warmth and hospitality of you and your staff. The music was incredible and we were within mere feet of the bands! All the musicians were warm and friendly and talked with us...unbelievable! Then when you walked down that hall and over to us and shook our hands and welcomed us to Woodstock, it was just simply incredible. After the music and you came back over to ask us if had enjoyed it, I was just blown away. Then when they annouced the raffle winner and we had taken that prize, too, I really expected to wake up and realize it was all a dream, but the Catskill mud on my cowboy boots the next morning assured me that it really had been a magical, once in a lifetime night. Thanks to you and my Darlin' Mark, for making it all happen. I hope to get back to Woodstock again sometime soon and back to the "Barn" for another music fix from the Master and his incredible friends and family. After a 3 hour flight delay getting to New York and another 4 hour delay on the way back to Texas...was it worth it? You bet it was. Would I do it again? You can bet the farm, if I get the chance, it's gonna happen! Love and kisses from Texas to you, Levon and all the other people who help you make the magic happen." "Levon, I believe last night was the highlight of my young life. (32 years and counting) I cannot justly express how touched I was being in your presence and sharing in such a magical evening. I am a huge fan, however that fact simply did not matter. You have done something in your creation of this beautiful event hat I believe will have a long lasting and enduring effect on all who enter your hallowed realm. It was through shear fate and just one miracle that I made my pilgrimage from olympia Washington to 160 Plouchman. Dreams do come true and miracles happen everyday. Thank you for helping me realize mine. I am already planning my next journey your way. Until then take it easy brother... Here is to you my good man -160 Plouchman the graceland of the catskills." "Levon WILL be appearing at several venues throughout the summer: Summer Stage in Central Park on June 28th, The Egg in Albany on June 29th, Bethel Woods on July 14th, Ryman Auditorium in Nashville on July 18th, Chicago Theater on July 19th and we're in the process of booking more! Keep checking our site for more information!" Also, see Levon's guestbook for a review (by Barbara O'Brian, featuring the Grateful Dead's Phil Lesh!) of last night's Midnight Ramble. "Last Saturday's birthday Ramble was one for the books. There have been many great Rambles, and this could have been the best. The energy level was way high, from The Sutter Band's particuarly hot set to The Levon Helm Band's magnificent set. It's hard to believe they're getting better. There appears to be a few tickets left for this Saturday; the Catskills are beautiful right now and I couldn't imagine not attending if possible. It should be another magical night at Levon's." T-shirts, sweatshirts and tote bags with that great new Levon Helm Band graphic by Mike Dubois, are now available for purchase from levonhelm.com. There's still music coming out of the basement of Big Pink: Check out the Hooligan Band's new album In The Pink! Added more details for the 1973 LP The Band in Concert. Thanks to Peter Viney and Ian Woodward for the info. Check the nice Memorial Day web page at Garth and Maud Hudson's web site. Happy 67th, Levon Helm! Birthday greetings may be posted in Levon's guestbook. Now available from levonhelm.com: Photos from the May 12 Midnight Ramble. Added a few quotes from the liner notes to the remastered reissue of Ronnie Hawkins' 1979 album The Hawk, courtesy of Peter Viney. Updated the various-artists discography with the 1994 CD Grooves Premiere Volume. Thanks to Jim Stehle for the info. Levon Helm Studios has announced a new Kid's Ramble on July 7, 2007. Added Oliver Buck's new CD Rust Belt Blues to the list of albums with cover versions of Band songs. WBWC 88.3FM The Sting is proud to announce THE BAND as one of the groups featured during the 2007 Summer Marathon Series. Starting at 7am (EST) Thursday June 28th, host Todd Richards will be playing 18 hours of music from The Band, featuring the remastered catalog, A MUSICAL HISTORY box set, and the member's solo careers. In addition, the marathon will feature artists who've been inspired by The Band's music, including artists from the recent 429 Records tribute ENDLESS HIGHWAY, and others. Additional events during the day are still in the planning stages. All day we'll have giveaways of the recent "Best Of A Musical History" (courtesy of EMI/Capital) and ENDLESS HIGHWAY (courtesy of 429 Records). Requests can be emailed in at request@wbwc.com or by phone (day of show please) at 440-826-7846. The complete 2007 Summer Marathon line-up is available at wbwc.com/summermarathon07. For more information, or to listen online (real audio) log onto www.wbwc.com. In 2004, the critically acclaimed Irish Band HAL released their first single "Worry About the Wind", a tribute to Rick Danko. A video is available from YouTube. See also HAL's official home page. Garth Hudson plays on the new album Let's Frolic Again from Blackie & the Rodeo Kings. Still not sure about attending one of Levon Helm's Midnight Rambles in Woodstock, NY? If so, Sean McCallum's review/travel report ought to convince you. Thanks to Adam Richards for the link. Updated the list of "The Band Cover Versions from the GB" with a cover of "Whispering Pines" by South African musician and producer Nux Schwartz. Added Peter Viney's review of the new Band compilation The Best of A Musical History. Levon Helm recorded with Finnish group The Latebirds in April, here's a photo from the sessions in Levon's barn in Woodstock. New dates and new tunes from The Last Waltz Ensemble. New "BandBite" from Carol Caffin: "D.A. Pennebaker Looks Back". "May 26th is a Ramble date AND Levon's birthday. Come and celebrate with us! Get your reservations now before they're all gone..."
"Another great night last night at the Ramble. Amy's back from Europe and she lit the stage, singing as no one else can - with that special eye-to-eye contact with her dad. Miss AnnaLee is here from Arkansas and when Levon sang The Weight, the tears of happiness flowed down her cheeks. It was a once-in-a-lifetime experience. When she and Levon embraced - there wasn't a dry eye in the place. New songs were added to the set list and, as usual, were amazing. Long Black Veil is one of them and it was incredible! Moving along to other business, I want to remind you that May 26th is Levon's birthday and we plan to celebrate at that Ramble so don't wait too long to get your "reservations". Let's do something special for him. Should we do a BBQ? Should we offer a Ramble special? Check the site in the coming days to see what we might do..... On another note, we're launching a LHS project that you can help with and participate in. Ask us about our "sponsor a square" and become one of the many who can help us with our goal - to save the house/studio, to pay down (or eliminate) the debt, do upgrades on the property, perform necessary repairs and maintenance and enable Levon to continue bringing this amazing music to his fans. Email me and write "square" in the subject field. I'll get back to you with details. We, his fans, are going to make this happen! Join us in attaining our goals! We need your help and we've got a deadline... Thank you, again, to you all. Without you, this wouldn't be possible. Thank you, Levon, for being our shining star... We love you." Added the albums A Country Christmas (Johnny Coppin, 1995) and Performs Bob Dylan & The Band's "Basement Tapes" Live at Joe's Pub (Howard Fishman, 2007) to the list of albums with cover versions of Band songs. Thanks to "Brown Eyed Girl" for pointing us to these CDs. "We're going to be adding some Ramble dates which will be held at Levon Helm Studios in Woodstock. They are: May 26th, June 2nd, June 16th, June 30th, July 7th and July 21st. As you all know, we're doing Summer Stage in Central Park on June 28th and those tickets are on sale through Ticketmaster. We're also speaking with Bethel Woods about bringing the Ramble there during the early summer months so watch for more information on that one. If you'd like to see the Ramble at other venues in the country, please feel free to pass that information along to me. Levon's ready to travel!" We're off to Riga, the capital of Latvia and home to some of the finest breweries in Europe. No more updates of The Band web site until next weekend, then. New Big Pink t-shirts available from levonhelm.com! "Robbie talks about The Best of A Musical History, his current project of the Native American stage show and says that he has just been asked to be the artistic director for the opening and closing ceremonies of the 2010 Vancouver Olympics. He says that three of his favorite Band songs are from NLSC. They are IMND, Acadian Driftwood and Ophelia. He says that they are true to The Band's music and he is particularly proud of them. He also says that both Levon and Garth were very helpful in putting together the box set and that he has extremely warm feelings for both of them." Listening to the interview, which is presented on the RS site as a "tracklist", requires user registration. This seems to be available only within the US. Maybe someone could transcribe this interview for The Band web site archives? Garth and Maud Hudson will perform at the Montreal International Jazz Festival in Canada on Wednesday, July 4, 2007 (the same night as Bob Dylan does his Montreal gig...). For tickets and more information, go to montrealjazzfest.com. Garth is also scheduled for a guest appearance with the Cowboy Junkies at the Montreal Jazz Fest on July 2. An 8-minute video interview with Robbie Robertson, recorded recently, is now available from ifilm.com. I believe the gig was originally to be held at another venue and Kro Bar was a late replacement, although it had been advertised for at least a week. Nevertheless there were no posters of any kind and the venue didn't seem to know what was going on, just that there was some band on "upstairs". It was an odd, but very intimate, setting - a small loft room with polished wooden floors and a couple of leather sofas at the back. The sort of place you might expect to see a small art exhibition. A couple of local acoustic acts opened the show, one of which was very good. I can't recall the guy's name but it was a pity he only had time for a couple of numbers. Ollabelle were already set up ready to go for 9.30pm. They lined up with drums, bass/dobro, guitar, mandolin and keyboard which, for any British readers, looked like something out of Dr Who - various home made looking effects boxes with knobs! I had a quick word with Amy Helm before they took to the stage - she was charming and friendly. Actually, there was no stage, they were just on floor level with the rest of us. The audience was very small, no more than 30 people but the room really couldn't have taken many more anyway. Sound wise, it was low key - the drums were not even mic'd and there were no sub speakers, just a small vocal pa and back line. They really were playing "live" in the room. It made for a very relaxed ambience and I'm sure very few people in the US get to see them in this type of setting anymore so it was something of a special occasion for me. Stand out numbers for me were the dark, gospel soaked "John The Revelator" and a glorious rendition of "Ain't No More Cane" with the whole band singing. Vocally, they were excellent with Amy and Aussie Fiona harmonising beautifully throughout and the others pitching in on a regular basis. Instrumentally, the keyboard dominated and despite the various contraptions on top of the instrument, the overriding sound was funky electric piano. Amy's mandolin cut through well, though, and it was great to see a Helm (or A Helm!) playing a mandolin in person. This is a band that deserves a wider audience here in the UK and, based on this performance, I'm sure they'll get it in the very near future. As far as this mini-tour goes, in the words of Ronnie Hawkins describing the early outings of Levon & The Hawks, "the few people that dug it really dug it". An excellent night. "New interview with The Band in the June 2007 issue of MOJO. It has been released in UK already. It has a list of '100 Records That Changed The World.' Music From Big Pink is #81 with notes by Bernie Taupin. Will Hodgkinson interviewed Garth Hudson and Robbie Robertson separately. Here is one excerpt from Garth: 'Dylan would be coming round the house three or four days a week, and there was a little typewriter on the coffee table in the living room that he would bash away on while we were in the basement. Richard wrote a song about that, Upstairs, Downstairs. As far as I know that'ss one of those few sacred Basement Tapes still in the locker.'" New "BandBite" from Carol Caffin: "Goin' Electric: Mickey Jones Talks About Dylan's 1966 World Tour and His (Mostly Fond) Memories of The Band". The Band Signed Lithograph Giveaway! Win a signed lithograph by Robbie Robertson of The Band! ENTER NOW! From salon.com: "Three questions for Robbie Robertson". Thanks to Alex Hoffman for the link. "If you have a song that's not doing anything for anybody, give it to Levon [Helm]. Let him start playing it and all of the sudden you've got a great thing going on. It's just an innate ability to extract the essence of what's going on in there and bring it out." -- from "Larry Campbell: Rock 'N' Roll's Right Hand Man", an interview published at jambands.com last week. Thanks to "Joy" for posting the link in the "guestbook". Garth the drummer! Nice 1974 photo from our friend John Scheele. New review by James Marcus of The Band tribute album Endless Highway posted at netscape.com. Amy Helm's band Ollabelle is currently on tour in Europe until end of May. They will be performing in, The Netherlands, Belgium, Great Britain, The UK, Ireland and Spain. See the Ollabelle web site for details. Happy Earth Day from Garth and Maud Hudson! 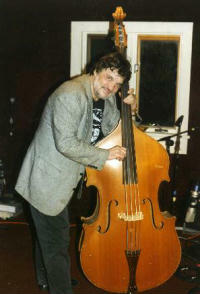 Added a 2001 photo of Rick Danko's sideman and sometimes Band member Sredni Vollmer and friends. Included the liner notes to Music from Big Pink. Thanks to Simon for posting them in the "guestbook". We've recently been told that the residents of Big Pink are having increasing problems with visiting Band/Dylan fans that ignore their privacy by peering in the windows, circling the house, knocking on the doors etc. The owners are accepting, to a point, the visitors to Big Pink to share its history. But, if these problems continue, the place may become off limits. So, the next time you visit this historical building, please stay back from the home, stay in front of the house and respect that this is a private residency. Levon will be filming a new movie, In the Electric Mist with Tommy Lee Jones, Kelly Macdonald and Ned Beatty. Levon will be portraying the Confederate General, John Bell Hood. Our young friends (and major Band fans) Yesterday's News, have just released an album featuring Garth Hudson, recorded at Levon Helm Studios, including a live cover of "The Shape I'm In": The North Side Hotel. The CD is available from cdbaby.com, for more about the group, see yesterdaysnewsmusic.com. The Band is on the cover of the April issue of the subscription-only PRO-QB magazine, an entertainment industry publication from FMQB. The magazine has a six-page article about the making of The Band tribute album Endless Highway, including an interview with Garth Hudson. The whole article is now available from garthhudson.com (PDF-file, requires Adobe's Acrobat Reader or compatible software for reading). "New Weird America" folk singer Marissa Nadler has posted a cover version (7.5 MB) of Richard Manuel's beautiful song "Lonesome Suzie" at her MySpace profile page. Thanks to Brent for the info. New "BandBite" from Carol Caffin: "Ronnie Hawkins Talks About 'The Boys' -- Then and Now"
Arkansas senator Steve Bryles has been commending Levon Helm for his outstanding achievements and his representation of the state of Arkansas, see the Senate Resolution available from the Arkansas Bureau of Legislative Research. "Local Legend Will Still Do Radiothon: Helm stands by 'I-man'" -- article from this morning's Middletown, NY, Times Herald-Record. Thanks to Dennis Cooper for the link. Hey, nice new graphics at the intro page for levonhelm.com. New, updated and extended version of Peter Viney's article about The Band's song "Up On Cripple Creek". Photos from Levon Helm's March 31 Midnight Ramble are now available from levonhelm.com. Three new Midnight Ramble dates at Levon Helms Studios in Woodstock, NY, have been announced for May 2007. "Robbie Robertson: Interview with a rock 'n' roll legend" -- from Indian Country ("The Nation's Leading American Indian News Source"), September 2006. Photos from the Rock & Roll Hall of Fame 2007 Induction Ceremony in New York in March, including a shot of Robbie Robertson, are available from veteran rock photographer Bob Gruen's web site. Nice photos of Robbbie Robertson from the independent A&R company Taxi's annual "Road Rally" in November 2006, where Robertson received a "Living Legend Award". Thanks to "Brown Eyed Girl" for posting the link in the "guestbook". Please visit garthandmaud.com for a musical Easter Greeting from Garth and Maud Hudson. In keeping with the generous nature & spirit of community of Levon Helm, Levon Helm Studios is offering an Easter Ramble Special (Saturday, April 7, 2007). If you bring a grocery bag filled with NON-PERISHABLE food items (ie: boxed pastas, canned soups, etc.) to be donated to a Woodstock food pantry, we will offer you a special Ramble price of "buy one, get one at half price". For more information or to order, call the studio between 10:00 a.m. and 4:00 p.m. at 845-679-2744. (Please - food items must be new, currently dated and unopened). This opportunity to help our community and to enjoy an evening of world-class music will sell out quickly so don't hesitate. New BandBite from Carol Caffin: "Eric Bazilian Talks About The Band, The Infamous Sony Deal, 'Atlantic City,' and Largo." "Levon Helm back at Madison Square Garden in May, for the First Time in 33 Years" -- great news from the West Saugerties Journal. The Levon Helm Band will be performing at The 18th Annual WFAN Radiothon which will take place at the Hard Rock Cafe in NYC, on April 12th and April 13th. They will appear between 6 am and 10 am when Don Imus is on the air. All proceeds from the event benefit Tomorrows Children's Fund, the CJ Foundation for SIDS and Imus Ranch. "Ronnie Hawkins & The Hawks: The Weight" -- YouTube video from August 2006 with The Hawk singing "Ricky's verse." "Levon Helm Bombards The Beacon". 30 photos from the Levon Helm Band's gig in NYC last weekend. Thanks to Joy for the link. Added a photo of Levon from the Beacon Theatre gig last weekend. Thanks to "Brown Eyed Girl" for posting a link to this pic in the "guestbook". "Helm takes another shot at music and the movies" -- article from today's Orlando Sentinel about Levon Helm's role as Tennessee assassination expert "Mr. Rate" in the new thriller Shooter. Added the album Funky Bluesy Jazzy Churchy (Spark Jiver, 2001) to the list of covers of Band songs. Thanks to Bill Munson for the information. Updated the list of "The Band Cover Versions from the GB" with a cover of "This Wheel's On Fire" by our favorite Italians The Beards. Cochran, Robert: "Long on Nerve: An Interview with Ronnie Hawkins," The Arkansas Historical Quarterly, Vol. LXV, No. 2, Summer 2006, pp 99-115. New "BandBite" from Carol Caffin: "Steve Forbert Talks about Wild as the Wind (and the verse that didn't make it into the song)"
Video clip from the Imus in the Morning NBC TV show 03.19.2007: Don Imus & Lou Rafino discuss the Levon Helm Band 'Rockin the Beacon'. From the Rolling Stone Rock and Roll Daily Blog Archive: "Levon Helm Leads An All-Star Lineup in NYC". "Now I Can Die In Peace" -- review posted at glidemagazine.com with (low-resolution) photos and video from the Levon Helm Band's 03.17.2007 concert in NYC. We're now back in Norway after an extended weekend in New York City/ Long Island, catching the absolutely brilliant Friday and Saturday shows with The Levon Helm Band and friends (including Garth Hudson!) at the Beacon Theatre on Broadway. Thanks to Kay for taking such good care of us and showing us the City with her lovely sister Wendy. Very nice to meet so many fellow Band fans and web site regulars at the venue. Also, thanks to Jeff and Nick et. al for the fun, the tequilas and what not. And to Amanda for feeding our bodies and souls. "The Weight," New York Times review of the novella Music From Big Pink by John Niven. Thanks to Dennis Cooper for the link. "Levon Helm makes a triumphant return to the big stage at the Beacon Theater" -- from the Times Herald-Record. "Dr. John, Garth Hudson join Levon " -- from the Poughkeepsie Journal. Midnight Rambles at Levon Helm Studios in Woodstock, NY, for every Saturday in April have been added. Tickets available from levonhelm.com. "Patti Smith Inducted" -- poem/ode to Rock Hall of Fame inductee Patti Smith. "Dylan Hears A Who!" -- new Dylan material "released". More tickets for the show with the Levon Helm Band this Saturday at the Beacon Theatre in NYC are now available from levonhelm.com! Added a photo of Bessie Smith's grave to Peter Viney's article about The Band's song "Bessie Smith". "Helm sues ad agency over use of Band song". "Rock and roll feuds of fame". "Roger McGuinn: Eight Miles High" -- '80s TV show clip posted on YouTube, with Roger McGuinn, John Sebastian, Jesse Colin Young, Richie Havens, Rick Danko, Levon Helm and Richard Manuel. Free download from levonhelm.com (PDF-file): Levon Helm Studios Calendar January ~ June, 2007. Sound samples from Bow Thayer's new album Spend It All, featuring Levon Helm on drums, is available from cdbaby.com. Link provided by Ray Gehringer. Added the Doberman Brothers' 2004 CD Baar å Bränn to the list of covers of Band songs. Too bad their 2007 world tour sold out already :-) Thanks to Anders Gistorp for the information. 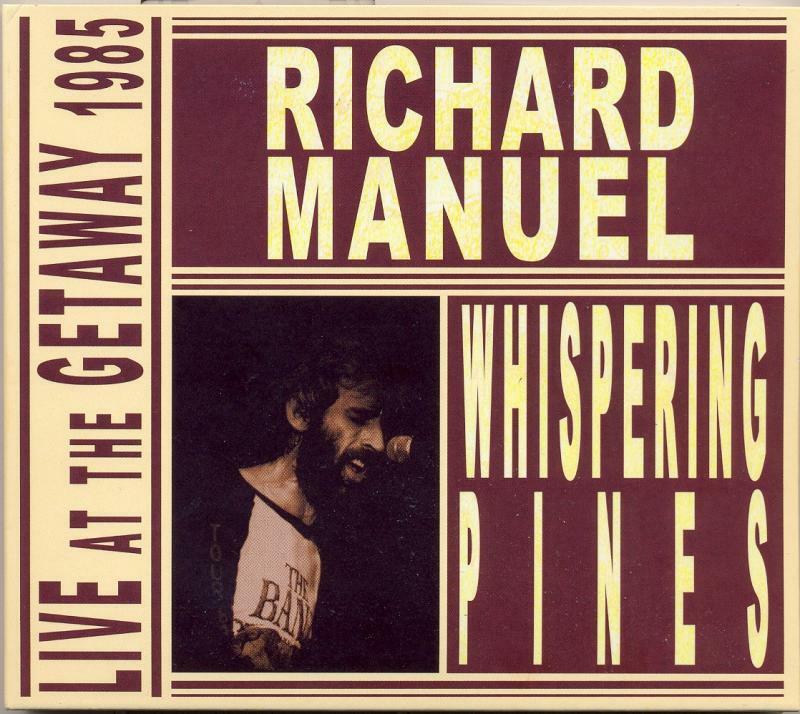 "One Voice For All: Richard Manuel" -- review of the Manuel live album Whispering Pines. Thanks to "Brown Eyed Girl" for posting the link in the "guestbook". New "BandBite" from Carol Caffin: "Playing in The Band: Jim Weider Talks About The Old Days and His New Music". The Levon Helm Band will be playing a benefit concert for the The Leary Firefighters Foundation and The New Orleans Firehouse Restoration Project, on Wednesday March 28 2007 at the Tarrytown Music Hall in Tarrytown, New York. Tickets go on sale on March 7, available from tarrytownmusichall.org. Garth Hudson posted a new entry today in his blog at garthandmaud.com. 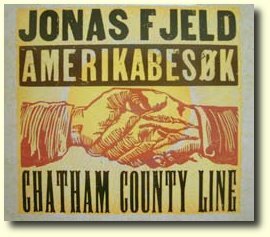 Norwegian singer/songwriter Jonas Fjeld, who worked with Rick Danko in the '90s, has just released a live album recorded in 2005 with bluegrass band Chatham County Line (interesting photos at their web site, scroll down a bit...) from North Carolina. The CD, titled Amerikabesøk ("Visitors from America"), has been praised by critics in all the major newspapers over here. Jonas starts a tour of Norway with Chatham County Line next week. Updated the list of "The Band Cover Versions from the GB" with two more recordings from that lovely "Group of people who lived near Woodstock and really loved to play Band music". Added the album If Your Memory Serves You Well (Serena Ryder, 2006) to the list of covers of Band songs. Thanks to Joe Jennings for the information. Despite the rise in ticket prices, all the Midnight Rambles at Levon Helm studios this year have been sold out, including the two upcoming dates that were announced for March 10 and March 24. Today, a new Midnight Ramble was added for March 31, 2007, at a new "spring season price" of $150.00 per person. We advise fans to order tickets now! 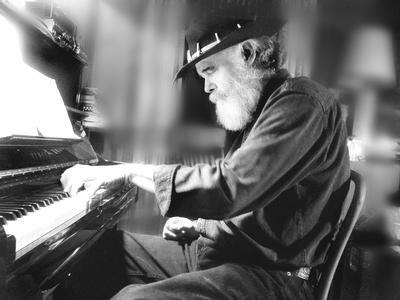 The Eye section of the Columbia Spectator in NYC has posted a recent interview with Garth: "Speaking the Same Language -- Garth Hudson on pedagogy and 'old' music", an overall good interview albeit a few typos, etc. Robbie Robertson appears on the 2006 benefit CD Can Be Heard -- A Moonstruck Sampler. Thanks to Brown Eyed Girl for the information. Replaced the two-year old photo of the webmaster at the "About this site" page with a new one taken today. "Well, gang, if you missed the show last night, you missed what was probably the best Midnight Ramble to date. Levon came out of the gates -- hotter than ever. To the roar of the crowd, he entered stage right, went directly to the drums and the Levon Helm Band belted out one of the best renditions of Rock And Roll Shoes ever heard. Larry Campbell, Jimmy Vivino, Mike Merritt, Erik Lawrence, Clark Gayton, Little Sammy Davis, Teresa Williams and Danny Louis (Government Mule) set the pace for an incredible evening. Set list included (but wasn't limited to) Atlantic City, Back to Memphis, Man of Constant Sorrow, White Dove, Ophelia, The Weight, WS Walcott, Down South in New Orleans, Chest Fever, Rag Mama Rag and - oh, my Lord - Remedy and Cripple Creek. There were 25 songs in all - one better than the other. Could this have been a rehearsal for The Beacon? We can only hope." "Outstanding. Anyone that was there will tell you that last night was a pull out all the stops night for all that played. Those that got to listen, still can't believe what they saw, and heard. In short, we had Alexis laying them 'Out Cold,' a 'Spinning Doctor' about, A 'Monkey,' rocking up in the loft, and a 'Gov. Mule' tickling the ivories, while Levon paddled down that good old 'Cripple Creek.' Shore up the rafters at 'The Beacon Theater,' a storm is coming though. Oh, what another night it was!" Added more information about the new The Band tribute CD Endless Highway. Thanks to Peter Viney and the regulars at the "guestbook" for the input. Both the March 16th and 17th shows with The Levon Helm Band at the Beacon Theatre in NYC are now sold out! "Bessie Smith" -- new article about a Band song from Peter Viney. "Our show coming up on March 2nd at The State Theatre in Falls Church, VA (DC), will mark our 40th in 1 years time! We will be featuring The Great Tommy Talton, writer of "Give A Little" and the "Got Song" from Levon's 1982 solo record Levon Helm." If you haven't been there already, be sure to check out the music available from the wonderful Valentine's Day Special in Garth and Maud Hudson's Family Room. Thanks to Peter Viney and Harm Van Sleen for the updates. "The Band" -- artwork by Jon Langford. Link provided by Freddy Mathisen. "The Weight" by "ysabellabrave" -- nice cover/video on YouTube. And we have lift-off! 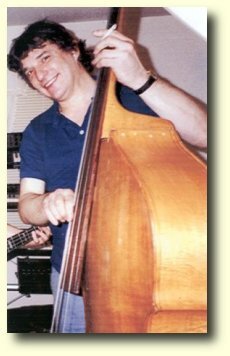 : "BandBites#1: Eric Andersen talks about Rick Danko, Festival Express, and DFA", interview and insights by Carol Caffin, with new audio file and photography. "Telecaster master: Jim Weider brings ProJECT PERCoLAToR to TCAN" -- good article from the Metro West Daily News. New Jim Weider concert dates, including a European tour in March/April. The March 17th show with the Levon Helm Band at the 2800-seat Beacon Theatre in NYC was sold out less than 15 minutes after Ticketmaster opened sales today! New great photos and audience review from the January 27th Midnight Ramble available from levonhelm.com. "Shape I'm In" -- new article about The Band's 1970 song, by D L Lewis from Australia. Please send your comments directly to the author. Rest in Peace, Eric Von Schmidt. "Levon Helm to play Beacon Theater" -- more about Levon's NY gig in March, from the Poughkeepsie Journal. See also levonhelm.com. "Robertson 'touched' by Band tribute album" -- article appearing in the London Free Press today. Robbie Robertson is quoted saying that a reunion of The Band "will never happen." This article is a shortened version of the Canadian Press article by the same author that appeared last week, where Robertson also says he "would be open to working with Helm again." Thanks to Serge Daniloff for sending us the link. On Art Garfunkel's new CD Some Enchanted Evening on Atco Records, he includes the following in the liner notes: "Special Thanks to Robbie Robertson for his insight and support." The CD, which came out in January in the United States, is a collection of standards by such songwriters as Irving Berlin, George and Ira Gershwin, Rodgers and Hammerstein and Harold Arlen. The album was produced by Richard Perry. Thanks to Tom Wilk for the update. "Band Tribute Album Lavishes Praise With Little Originality" -- review of Endless Highway: The Music of The Band from thekansascitychannel.com. Thanks to Norbert for posting the link in the new "guestbook". Levon Helm will be performing with Larry Campbell at the Beacon Theater in New York on March 17th, according to Campbell's web site. New song included in the list of covers of Band songs by users of The Band web site: A studio recording of "It Makes No Difference" (6.5 MB MPEG-3 file) by Deepwell. Comment from the group: "This is the only cover song we've ever recorded. There's no way we could ever come close to Rick Danko's moving performance of the song in the movie The Last Waltz. He sang it like he was afraid he'd never get to sing it again. Although he didn't write the tune, he totally made it his own with his voice. Deepwell dedicates this unworthy effort to his memory. RIP." "I love Garth Hudson's work and abilities and Levon Helm's tremendous talent"... Despite their feud, Robertson says he would be open to working with Helm again. "If something came up that made sense for both of us, of course, I don't have any issues with anybody," he says. Today is the official release date of Endless Highway: The Music of The Band! In stores now. Order online at amazon.com and circuitcity.com. Endless Highway: The Music of The Band is number one on the Americana Archive Playlist for the week of Monday, January 29, 2007. Thank you and Congratulations to 429 Records (Savoy) and all the artists who participated in this tribute to The Band. "Robbie Robertson's Big Break: A Reevaluation of Martin Scorsese's The Last Waltz" -- interesting 2002 article from Film Quarterly magazine, "the most authoritative academic film journal in the United States." "What can I say? It was yet another incredible Ramble last night. The Alexis P Suter band set the pace - rockin' the house with her powerful, amazing and soulful voice. The Holmes Brothers followed with Larry Campbell playing along on every instrument that has strings and Glenn Patcha (of Ollabelle) lending a hand on piano. Again, those in attendance were spellbound. And then Levon hit the stage and everyone was on their feet to welcome him onto his own stage. Joined by masters in the music world - Larry Campbell, Jimmy Vivino, Brian Mitchell, Steven Bernstein, Erik Lawrence, Jay Collins, Paul Ossola, Amy Helm, Theresa Williams, Little Sammy Davis, Tony Leone (also of Ollabelle) AND by a surprise song by Catherine Russell - Levon brought the house down. Tears, smiles, standing ovations, dancing in the aisles and a general feeling of euphoria was visible throughout the almost two hour set. The set list was extensive and unforgettable - Man of Constant Sorrow, Got Me A Woman, Evangeline, The Weight, Down South In New Orleans, Rock and Roll Shoes, White Dove, Ophelia, Chest Fever, Tears of Rage and the list goes on and on and on... Every song brought a different emotional reaction. LEVON IS BACK! You can't miss these Rambles, people. If you want to recapture the real music that these musicians are respected and known for - you HAVE to make the trek to Woodstock to experience it. And the whole night is an experience - from pulling into the driveway and being greeted by an amazing group of loyal friends of Levon's, to sharing your stories with the new friends you'll meet there, to shaking Levon's hand as he enters or exits the stage area, to mingling with the legends in the music industry throughout the night, to standing by the massive fireplace, to sitting in the private home/studio of Levon Helm, to feeling a love and warmth you'll never feel in any other venue. It's difficult to explain how it all feels, but it's something in the gut, in the heart, in the soul and the only way to truly understand it is to be there. Thank you to everyone who makes it possible and thank you to Levon for having this incredible dream and for allowing us to be part of it. I can speak for all of us at Levon Helm Studios - we are enriched on all levels by being here! We love you, Levon." "Helm hard at work on new album"! 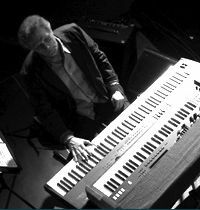 "Robert Robertson Won't Stand on Ceremony" -- January 2007 interview from jambands.com with interesting updates on "Robert's" new projects. Thanks to Tim W. for the link. NEW YORK, January 22 -- Beginning in February, Carol Caffin, journalist, music-industry veteran, and longtime publicist to Rick Danko, will present Band Bites, a series of Band-related interviews, exclusively for The Band website. The interviews, conducted by Carol, will feature various artists, industry insiders, friends, and colleagues who have or have had a legitimate Band connection -- and something interesting to say. "By 'Band connection,' I'm not talking about the guy who pumped gas for Levon or the girl Rick promised to put on the guest list in exchange for denting her bumper," says Caffin. "I think fans really want to know what it is and was like 'behind the music,' particularly because The Band has always been so enigmatic." "There's always been a mystique around The Band," says Caffin, "and there always will be. That mystique was not 'created' by Albert Grossman or anyone else. It was and is intrinsic. These are five complex guys-nobody really knows them completely." The first Band Bites interview will be featured on February 15. In addition to interviews, the series will include occasional "surprises" in the form of sound bites, audio and radio interview snippets, and more. Artists, friends, or others who'd like to be considered for Band Bites and who have a legitimate (and verifiable) Band connection may contact Carol directly by emailing her at Carol@rickdanko.net. Serious inquiries only, please. Fans who would like to be on an upcoming Band fan email list may email Carol at Carol@rickdanko.net. Please note "Band Fan E-List" in the subject line. "If you missed last night's Ramble, you're going to regret it. In addition to the amazing and powerful accoustic set played by Levon and his band members (Jimmy Vivino, Mike Merritt, Brian Mitchell, Erik Lawrence, Art Baron, Little Sammy Davis), the electric set was just that - electric. Ophelia, Rag Mama Rag, Chest Fever, Tears of Rage, Rock and Roll Shoes and about 10 others that rocked the house, but the icing on the cake was The Weight! Tears flowed, smiles were a mile wide and the audience sang every lyric along with the band. Don't let the weather deter you, skip the babysitter and bring the kids with you and make arrangements to come to a Ramble soon. Not only do you not know what surprise guest will appear on stage, but you also never know what amazing tune Levon will pull out of his hat! Come and be part of a true historical event.., Thank you to all who braved the high winds and frigid temps. Nothing prevents the Ramble from taking place. Thank you, Levon, for continuing to give us the most precious gift in the world - your warmth, your talent and your beaming smile! We do love you." "Homespun just released Professor "Louie"'s new instructional accordion DVD. Lots on tap for this year here at Woodstock Records, two new CDs and more CD/DVD projects in the works. And, Professor "Louie" and the Crowmatix are now on MySpace." Tonight's Midnight Ramble at Levon Helm Studios in Woodstock, NY, featuring The Levon Helm Band with Jimmy Vivino, The Alexis P. Suter Band, Bow Thayer and guest MC John Scurti, is now sold out!! There will be a Kid's Afternoon Ramble at Levon Helm Studios on March 31, 2007, see levonhelm.com for more information. Levon Helm plays on Bow Thayer's new album Spend It All. "Hanging with the Band" -- Jim Weider interview. "The film rights to John Niven's highly acclaimed novella Music From Big Pink have been optioned by respected producer/writer team Stephen and Jez Butterworth, whose CV includes the movies 'Mojo' and 'Birthday Girl' which starred Nicole Kidman. More recently Jez has written the script for the new Paramount Pictures James Brown biopic which Spike Lee is slated to direct later this year. They are looking forward to trying to bring Niven's book to the big screen." "The American Beauty Project" -- an all-star, free(!) special 2-night tribute to the Grateful Dead in New York next weekend, featuring Amy Helm and Ollabelle. "A Former Traveler Journeys on Her Own" -- about Martha Scanlan's new album The West Was Burning, featuring Levon and Amy Helm. "The Notorious Byrds Brothers" -- 1985 review of a Byrds "reunion" concert featuring Rick Danko and Richard Manuel. Thanks to Tim for sending us the article scan. The legendary Donald Fagen, with Ollabelle and Amy Helm, will play at the Bearsville Theater outside Woodstock, NY, on Feb. 2-3. See this article in the Poughkeepsie Journal, mentioning both Levon Helm and The Band web site(! ), for more information. "Legendary promoter Bill Graham rocks on with treasure-trove tribute site" -- article from the Chicago Maroon. Thanks again to Jeff for sending us links. "Pete Kleinow, 72, Guitarist for Flying Burrito Brothers, Dies" -- obituary from the New York Times. Thanks to Jeff for the link. New photos from the New Years Eve Midnight Ramble available from levonhelm.com. A 50-minute long radio program/interview with Robbie Robertson, from July 2006, is available from KUOW 94.9 Public Radio. Sneaky Pete and Garth Hudson, 2004. "The Acoustic Storm Interview" with Garth Hudson and "Sneaky" Pete Kleinow. Sad news: Pedal steel legend "Sneaky" Pete Kleinow, who until recently worked with Garth Hudson in Burrito Deluxe, passed away this weekend. "Albert Grossman's Ghost" -- interesting 1987 article from Musician, with comments from Garth and Ricky. Thanks to Peter Stekel for typing in the text for us. Levon Helm portrays a ballistics expert in Antoine Fuqua's new action film Shooter, starring Mark Wahlberg and Danny Glover. A movie trailer, where a bespectacled Levon appears briefly, is available from the official Shooter web site. Thanks to Joe Lore for the link. While you're there, you may want to check out the MySpace entries for Maud Hudson, Jim Weider, and our house DJ Final. Robbie at the Governor General's Performing Arts Awards Gala in Ottawa, with Dione Taylor, who sung "The Weight" at the event, and Buffy Sainte-Marie. 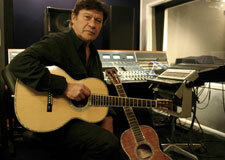 Robbie Robertson was awarded a Canadian Award for Lifetime Artistic Achievement in November. Read more at the Governor General's Performing Arts Awards web site. Thank to Brown Eyed Girl for the info. 1976 photos of Richard Manuel and Levon Helm are available from the Flickr photo sharing web site. The cover story of the April 2004 issue of Rolling Stone was titled "The Immortals - The Fifty Greatest Artists of All Time", with a short article about each of the "greats", written by a music celebrity. Our boys were at #50 (50?! ), the comments on The Band were written by the lovely Lucinda Williams. Ms Williams' piece is now available from rollingstone.com. Added chords for the Rick Danko song "Home Cookin'". Contributed by Graham Galatro. "Dunc" and wife in Stratford. Tony O'Shaughnessy and family at Big Pink. Photos from the December 30th Midnight Ramble. Check out the new Jim Weider signature amp! Thanks to our ol' friend Stu for the link. Added a 1971 photo of Ricky, by John Scheele. Added an MPEG-3 file with Dylan and Danko doing a live version of "I Shall Be Released", from a concert in CT in August 1997. The bootleg Back at Wolftrap has two more tracks from the same gig. Check also Dylan's introduction of Ricky. Thanks to Jonathan Katz for sending the audio files. A TV film with The Band doing "Slippin' and Slidin'" live at the Paris Olympia on May 25, 1971, is available from the ina.fr TV and radio archive site. QuickTime video plugin required for viewing. Thanks to "Empty Now" for posting the link in "guestbook".